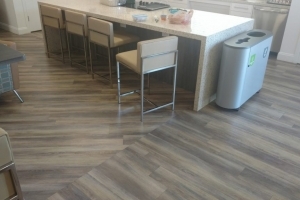 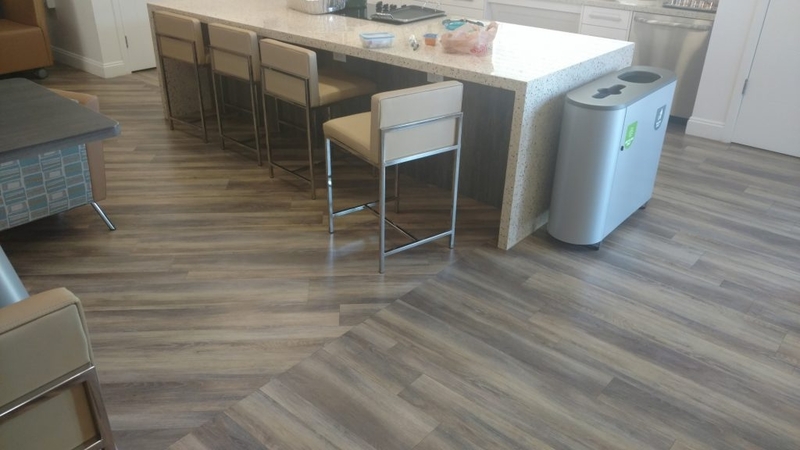 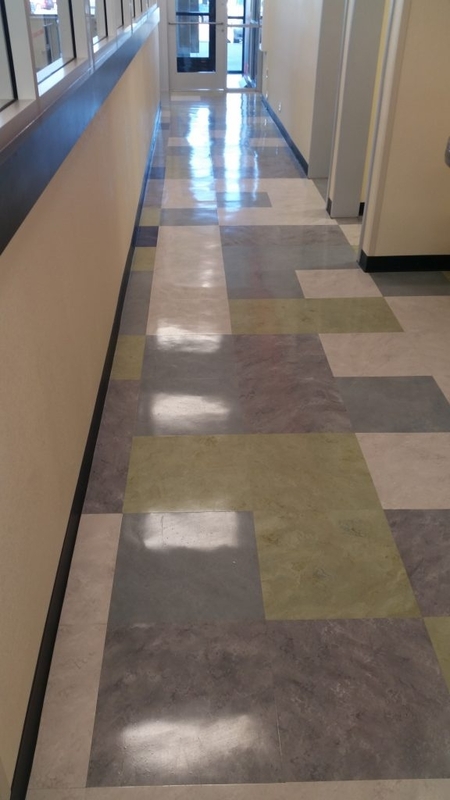 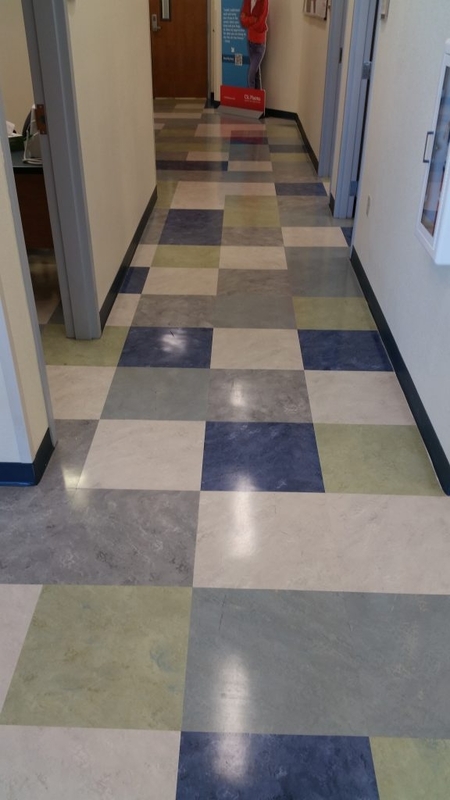 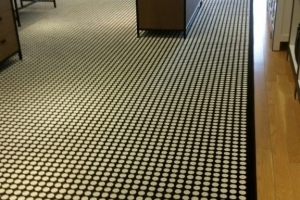 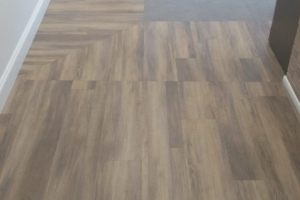 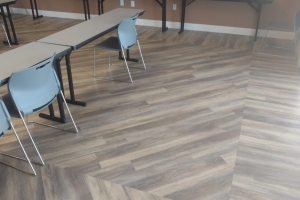 Looking for Commercial Flooring Installation and Superior Customer Service Near Phoenix, AZ? 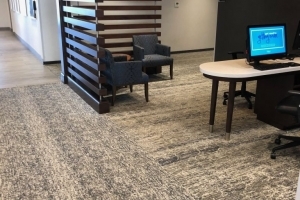 At ABS Floor Covering, we’ve built an impressive project portfolio that covers many different types of commercial and residential properties you’ll find throughout the greater Southwestern United States. 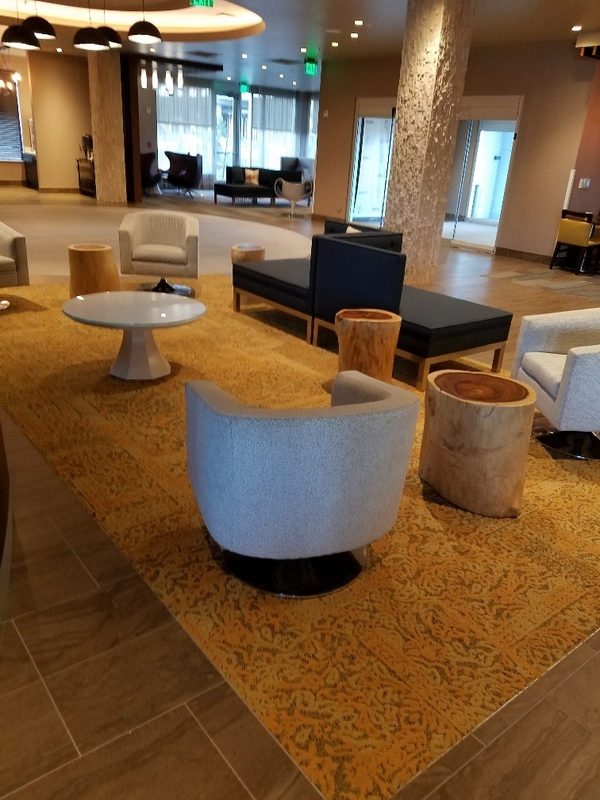 Please take a moment to browse some of the projects we’ve completed recently to get a better sense of our quality craftsmanship and the onsite problem-solving ability we’ve gained a reputation for over the years. 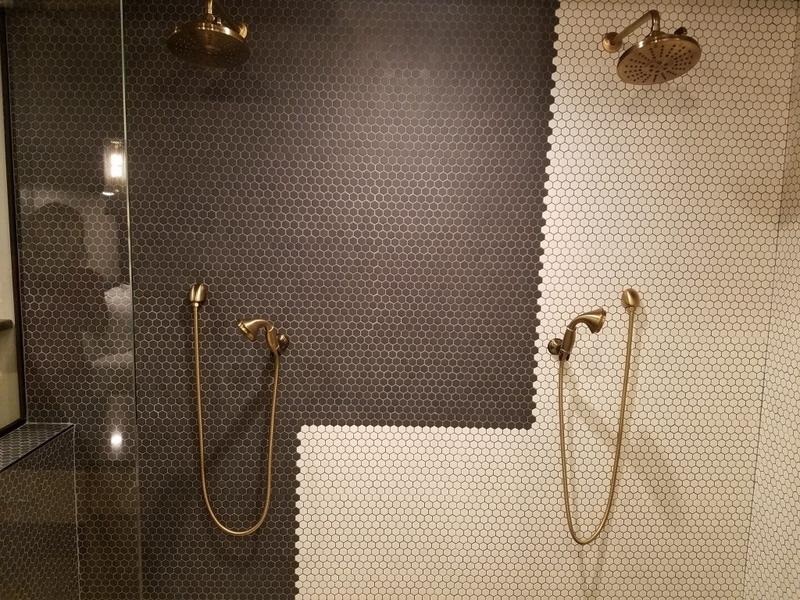 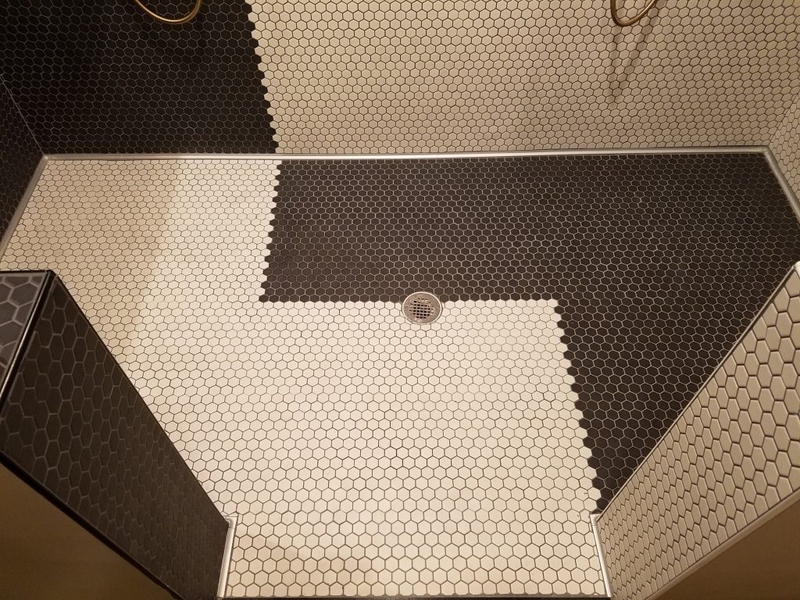 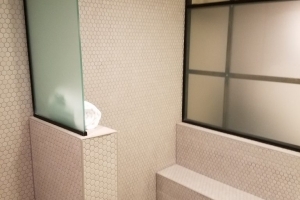 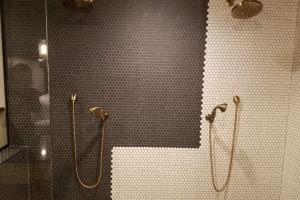 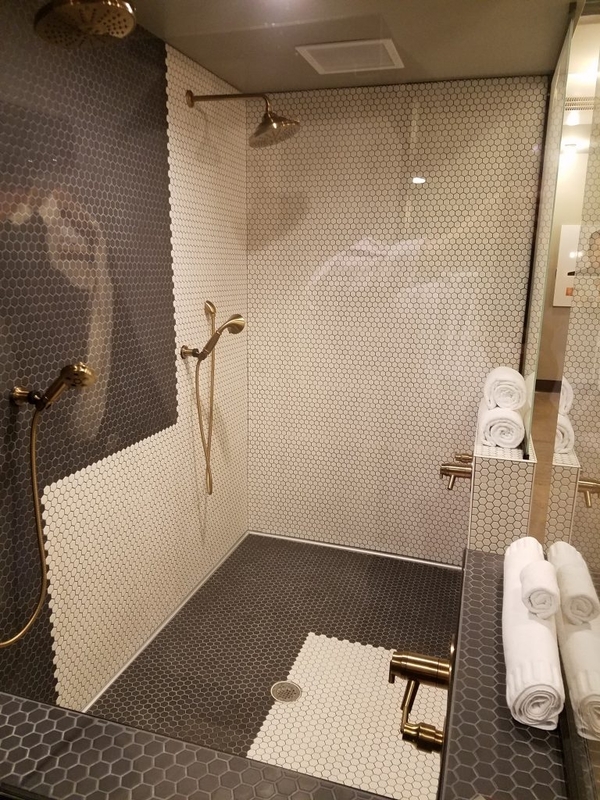 Found:RE Hotel was an award winning Hospitality Remodel project whereby it had 8 floors of mud floor showers, and over 28,000 Sq/ft of mosaic installation over shower walls and floors and benches. 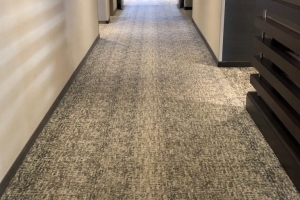 Over 7,000 Sq/yd of glue down broadloom and carpet tiles throughout. 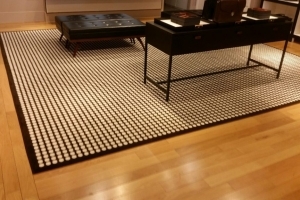 Herring bone carpet rectangles down in gallery. 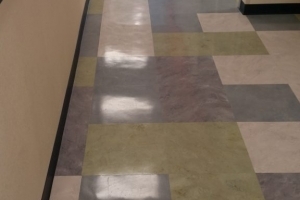 Different arrays of tile throughout 1st floor common areas. 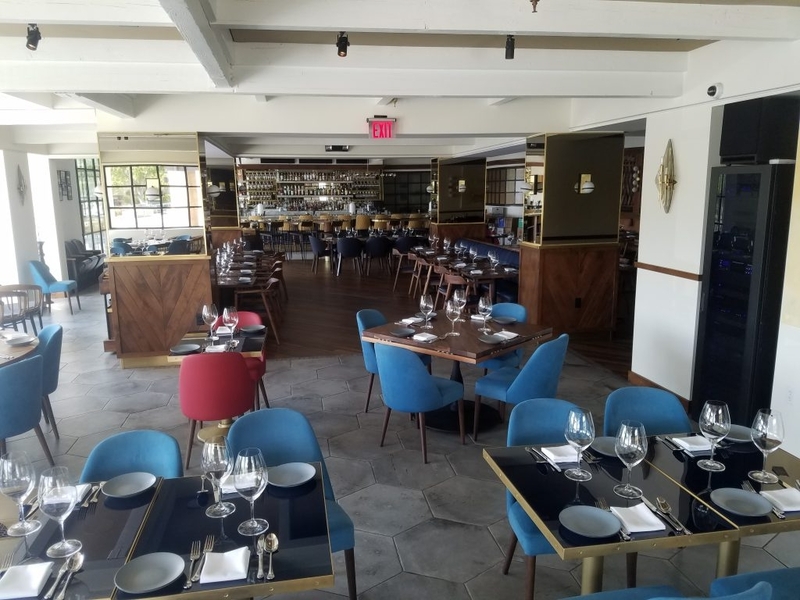 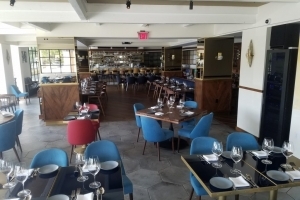 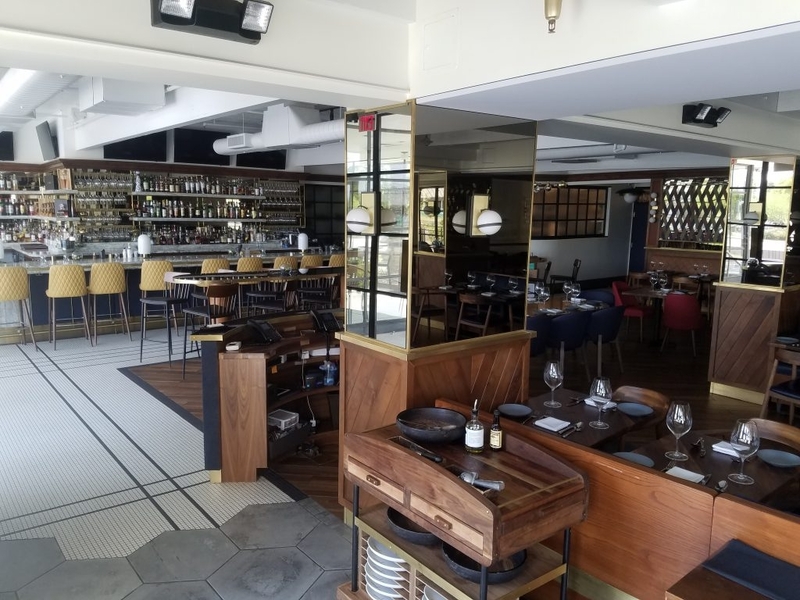 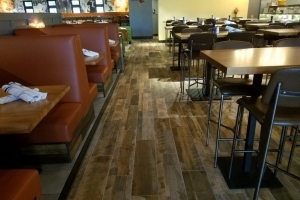 Fat Ox Restaurant in Scottsdale consisted of a vast array of ceramic, porcelain and stone tile selections. 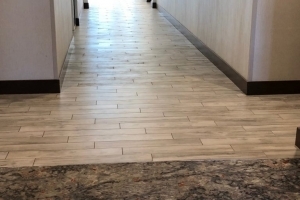 Flooring ranged from multi colored mosaics to exterior limestone, wrapping the entire front of the building. 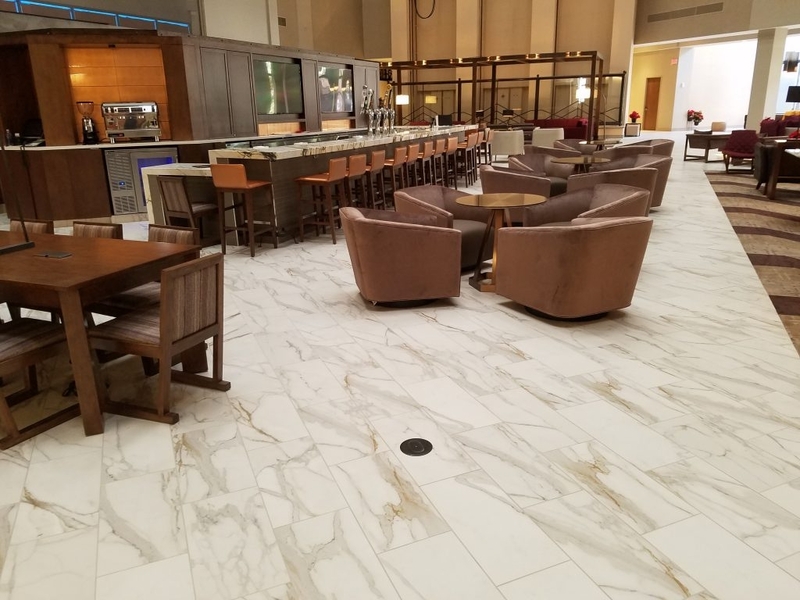 The inside dining areas consisted of approximately 10 different types of porcelain and ceramic tile shapes and compositions. There was also mixed colors and patterns of glazed and hand crafted ceramics at various walls and rooms. 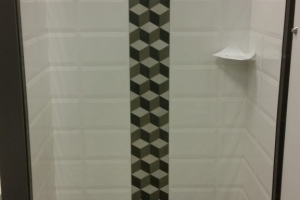 All black hexagons were inset by hand, 1 piece at a time. 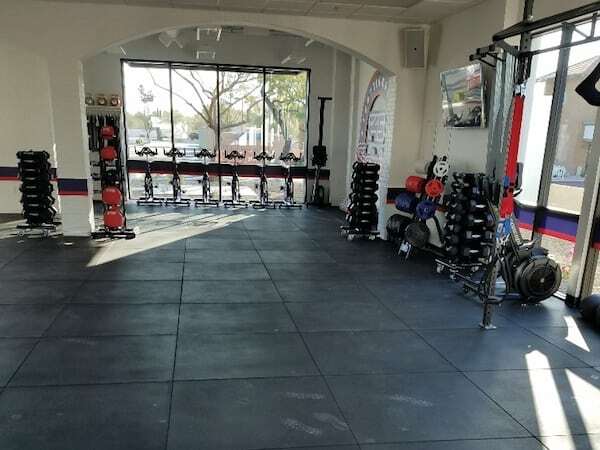 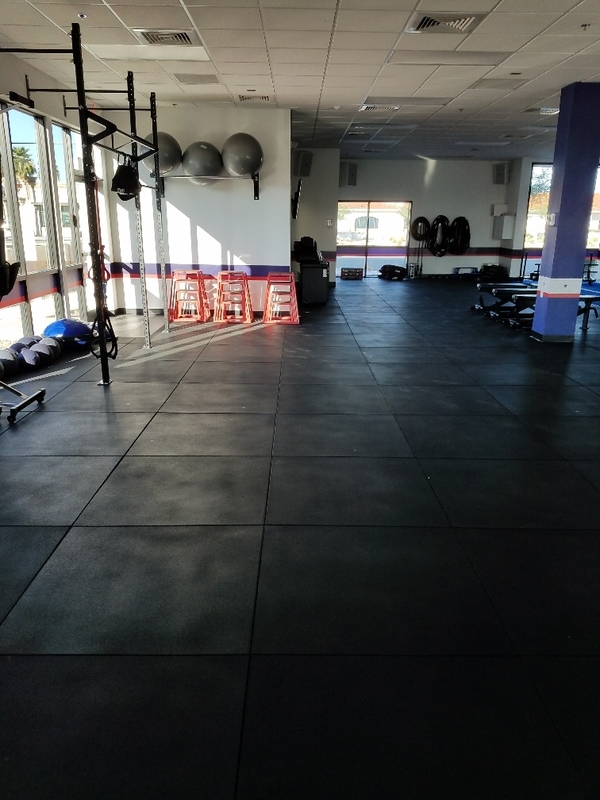 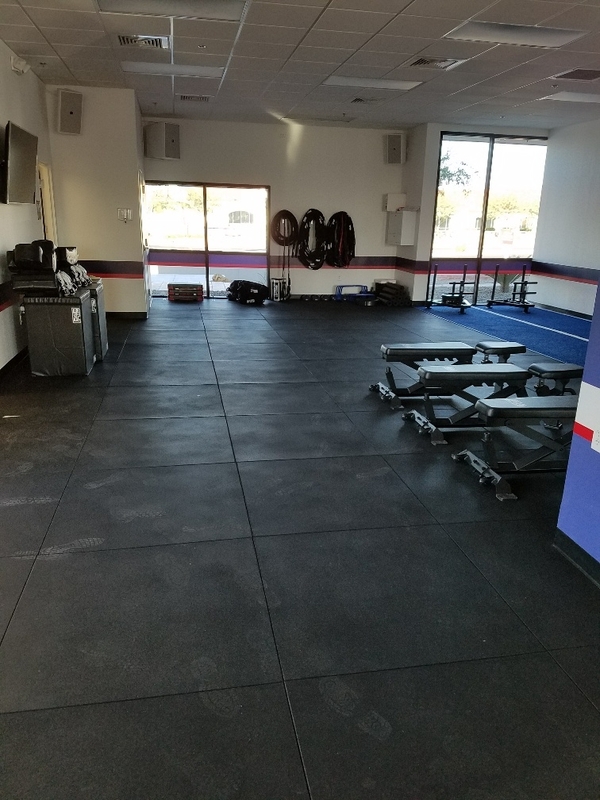 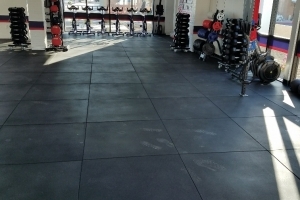 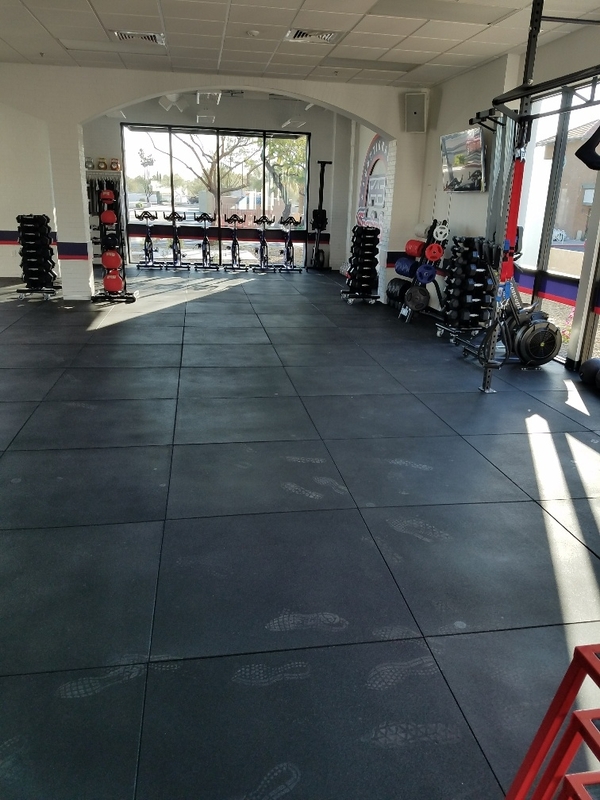 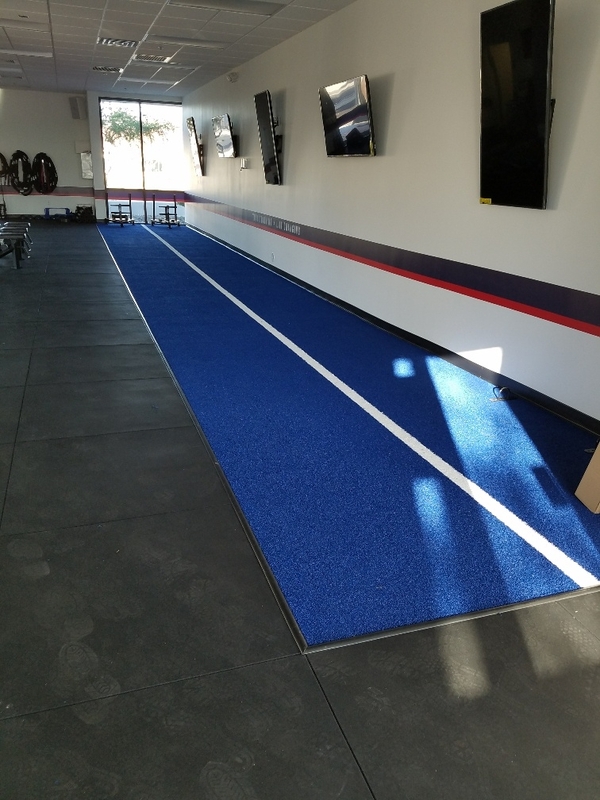 F45 is a fitness gym remodel for Tenant Improvement. 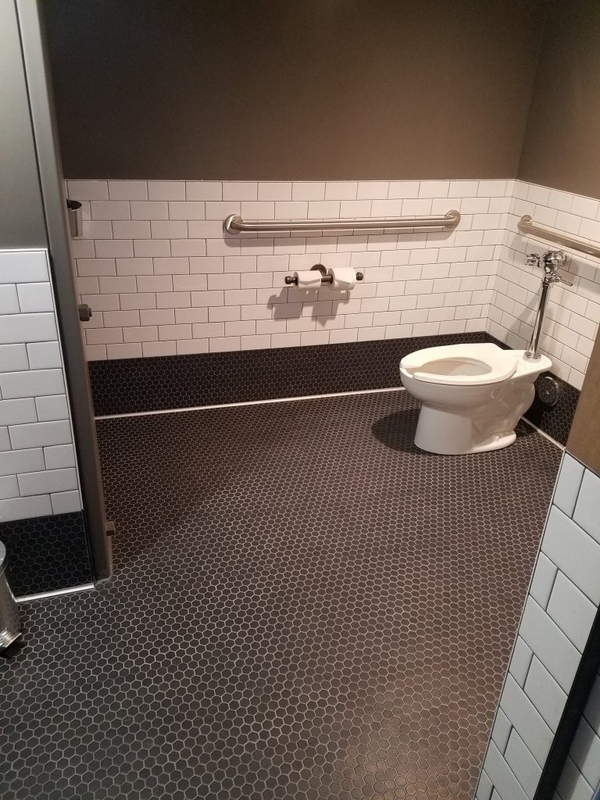 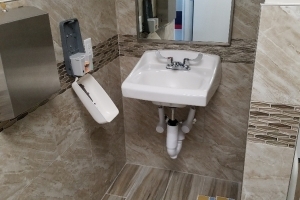 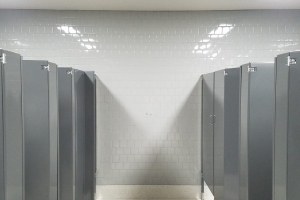 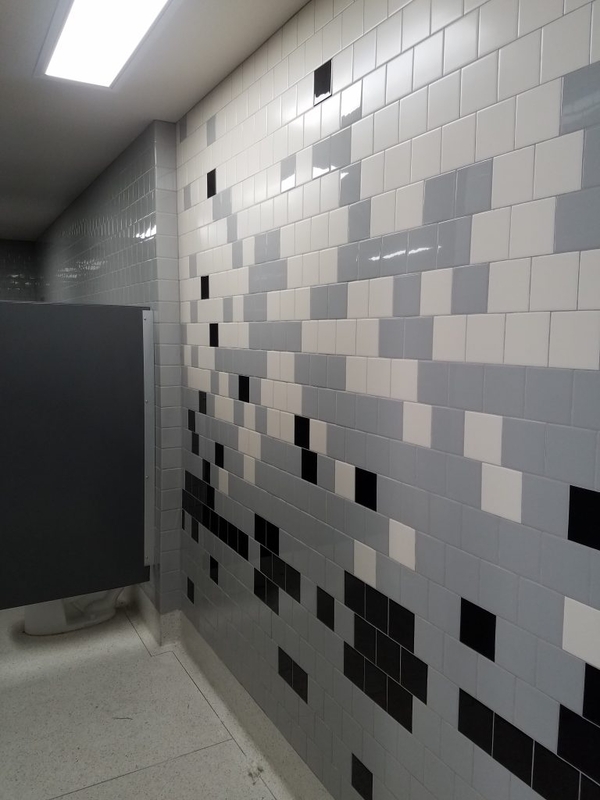 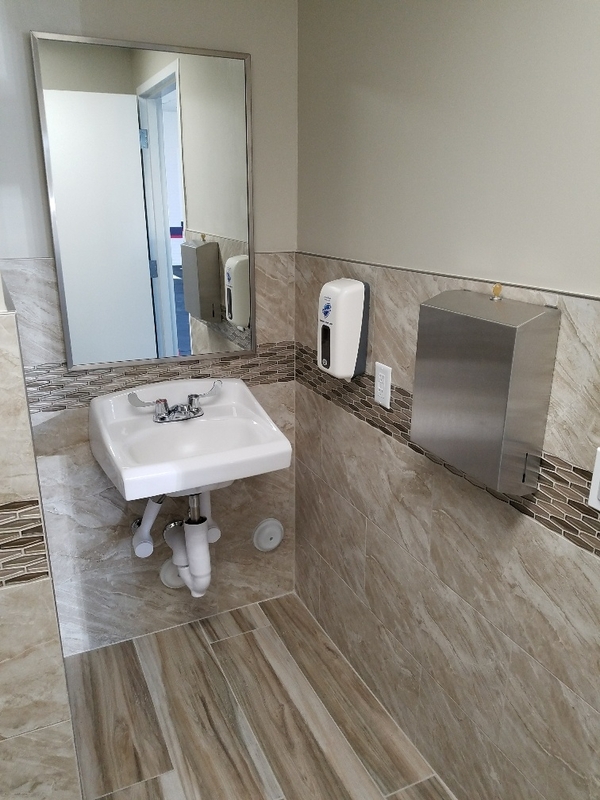 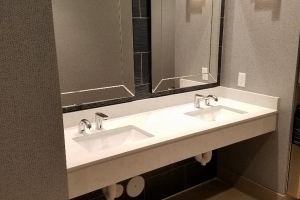 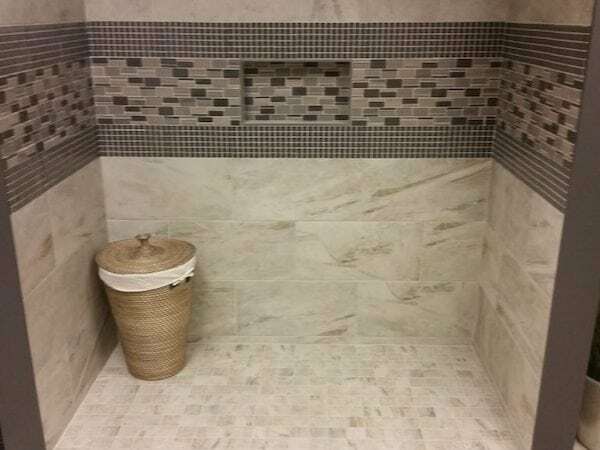 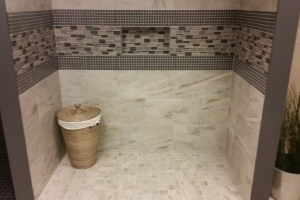 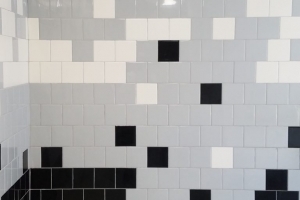 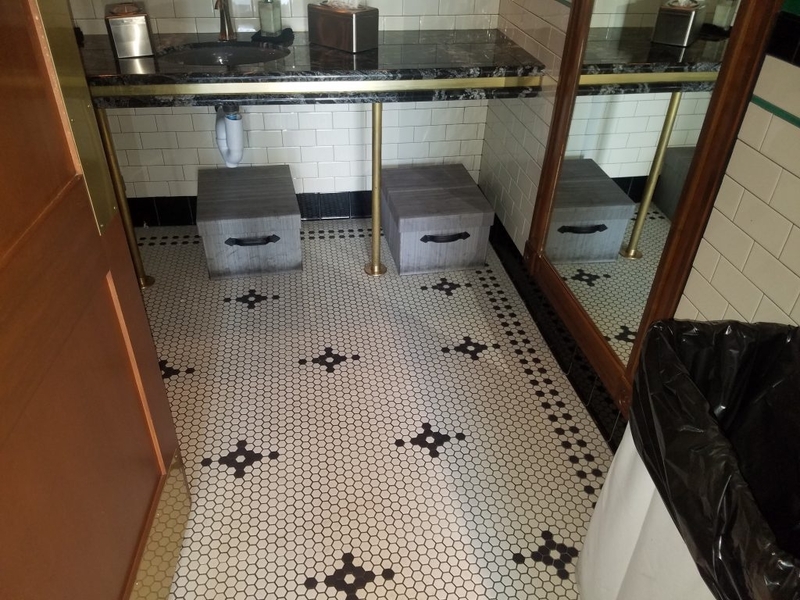 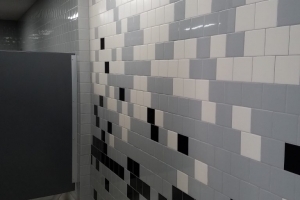 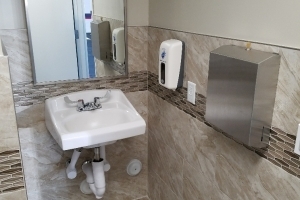 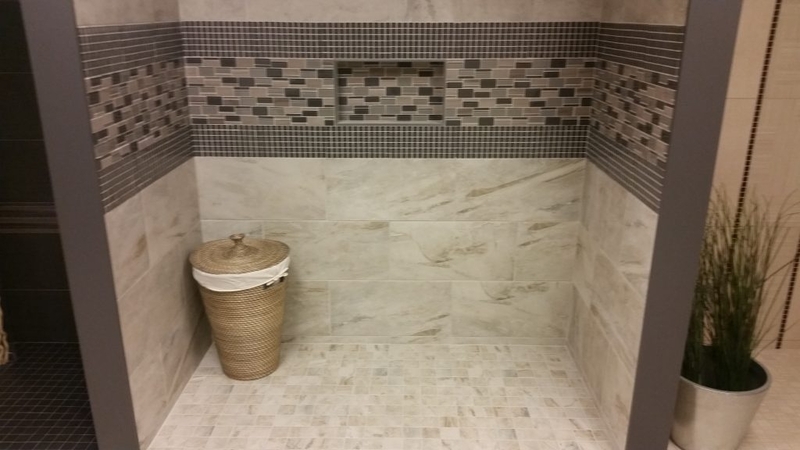 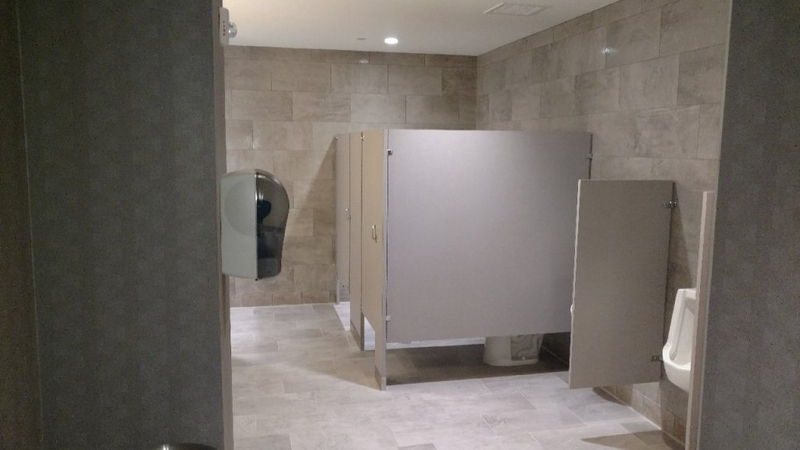 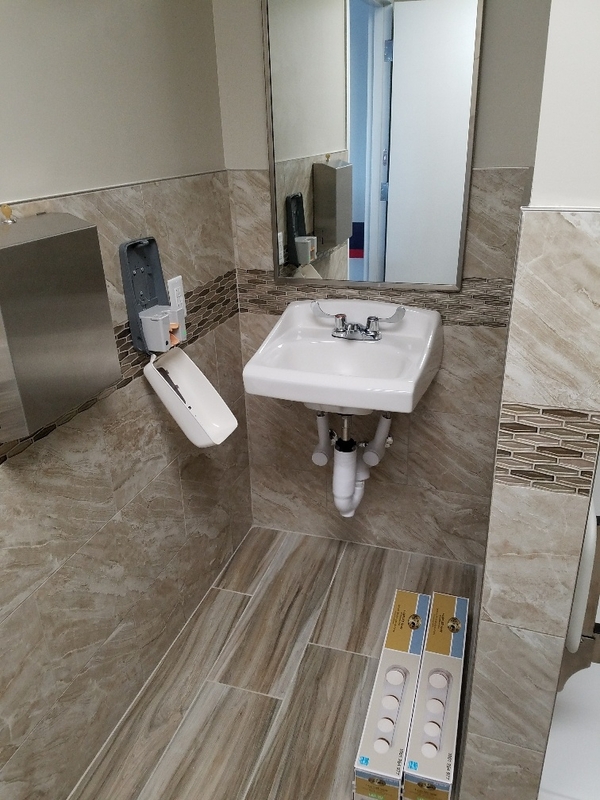 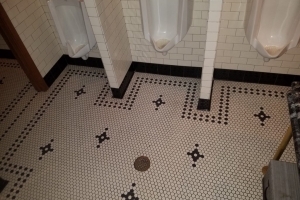 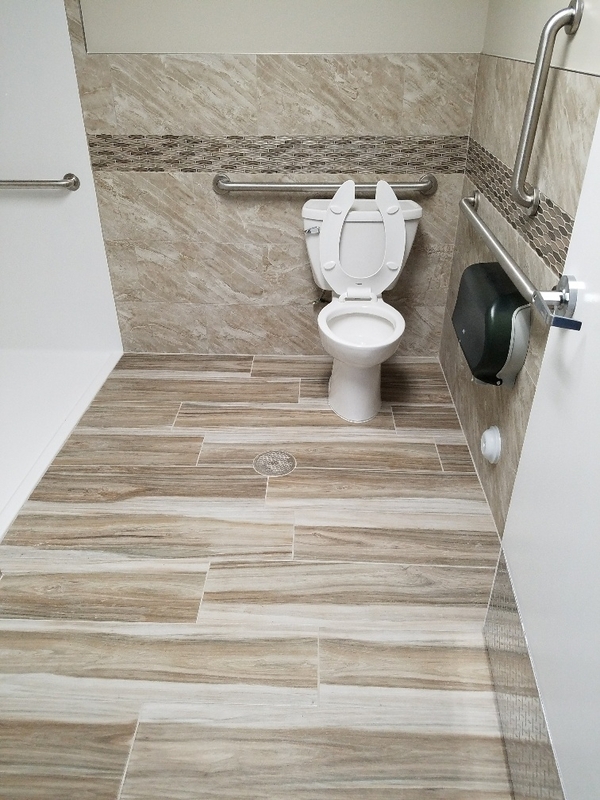 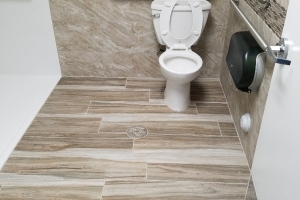 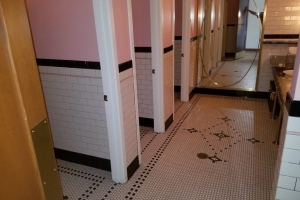 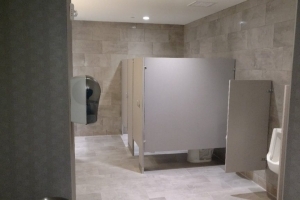 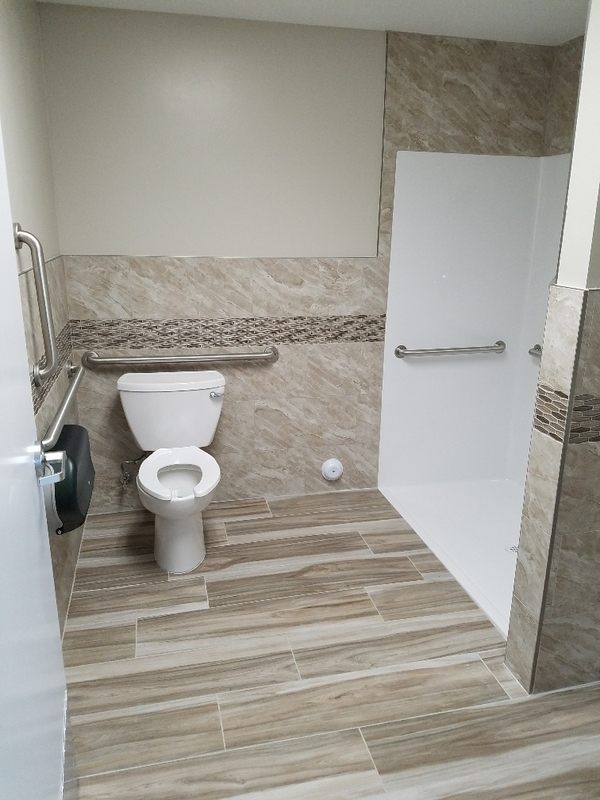 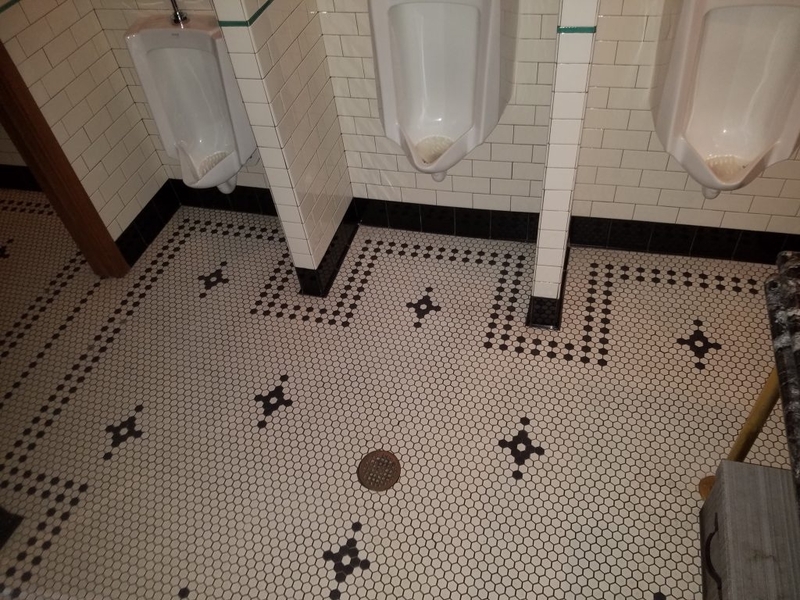 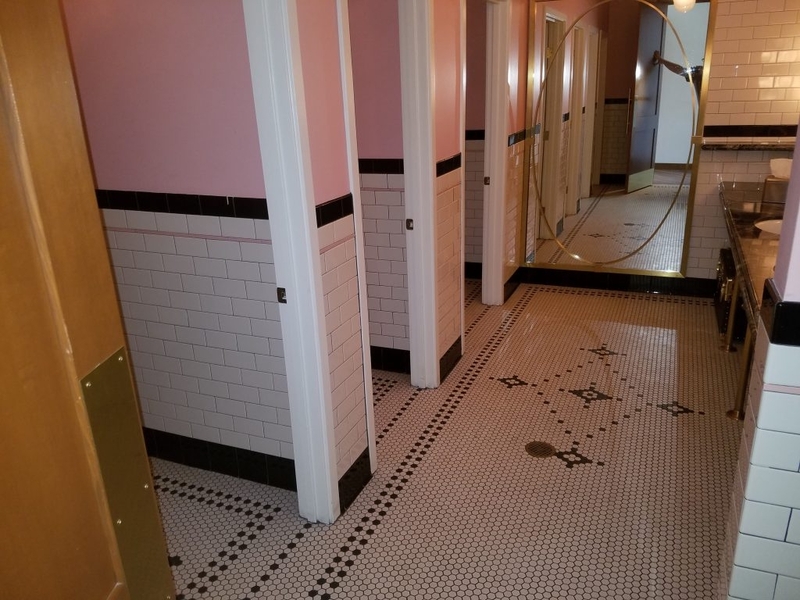 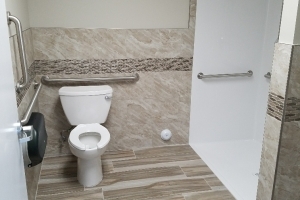 This project consisted of owner supplied tile and mosaics at the restrooms along with metal trim. 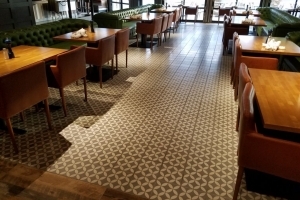 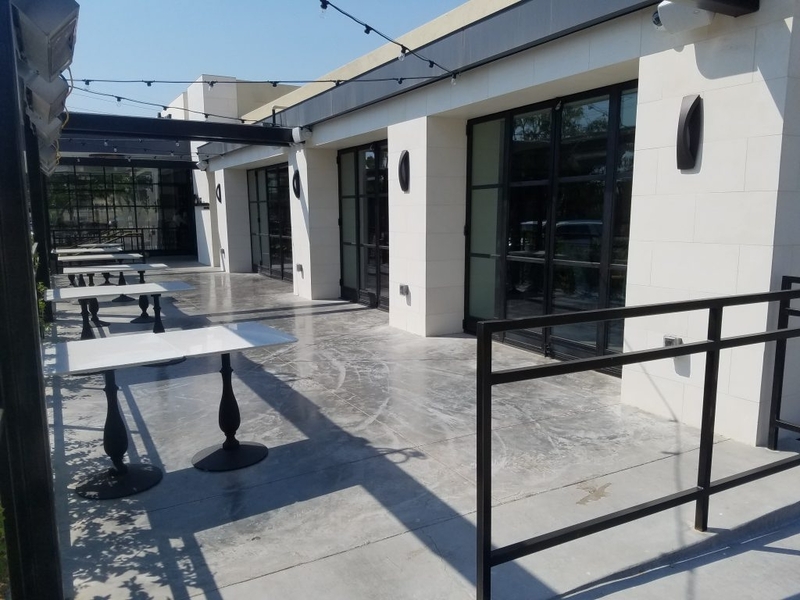 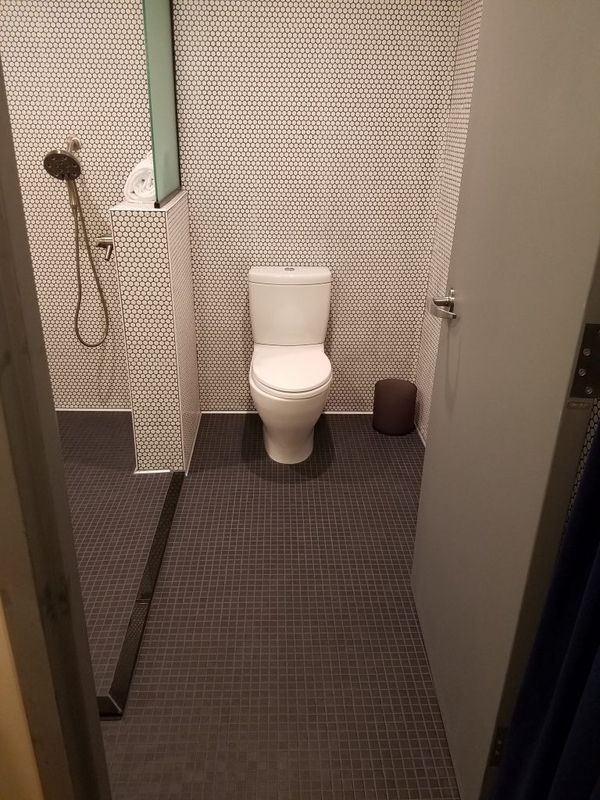 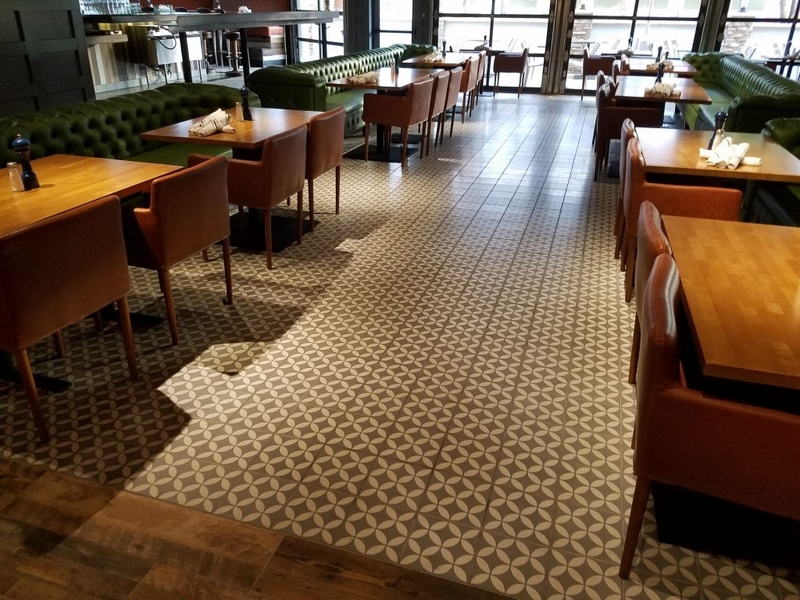 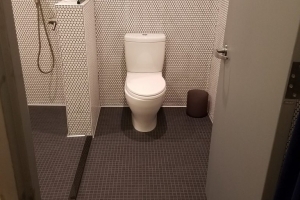 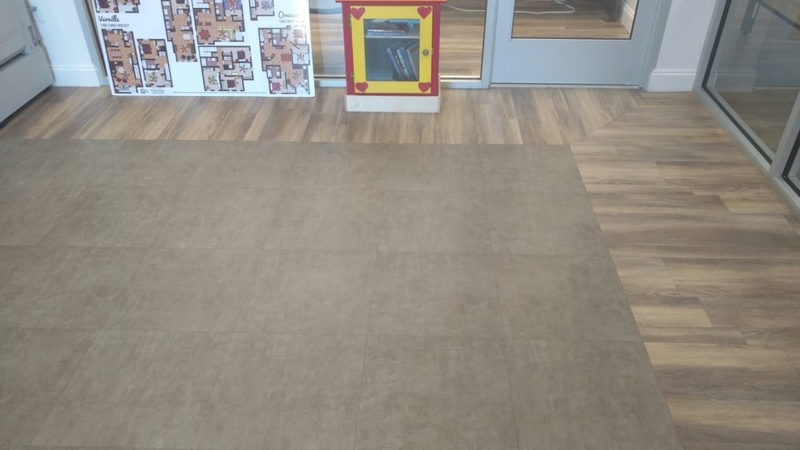 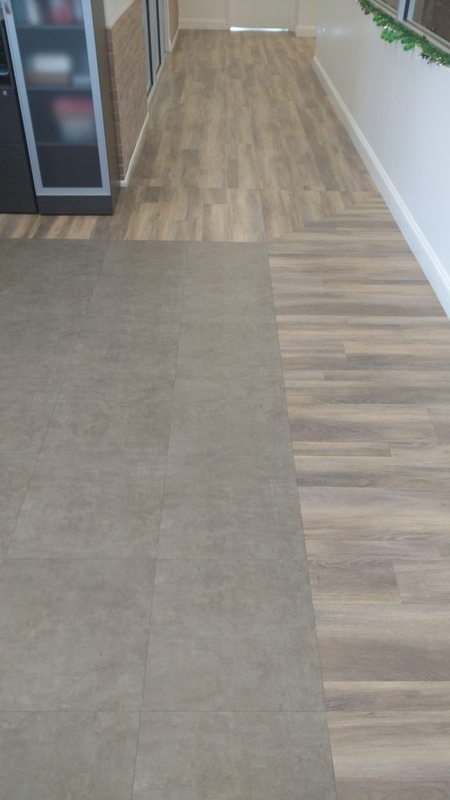 The general area consisted of 12×24″ porcelain tiles at entry, along with large format rubber tiles with glue down astro turf. 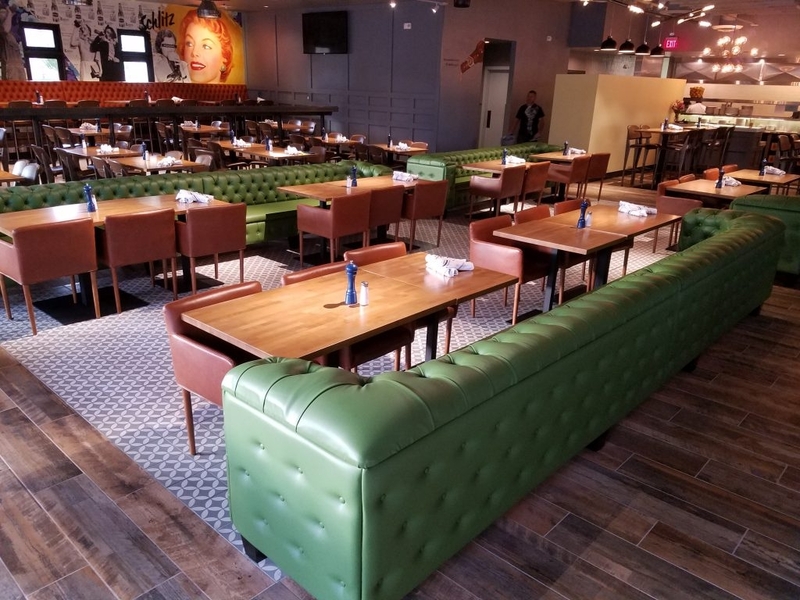 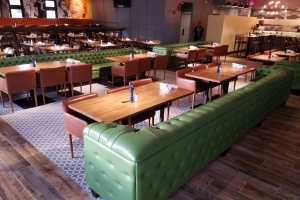 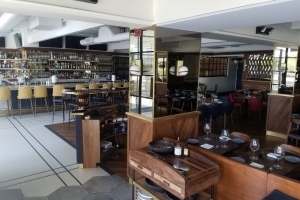 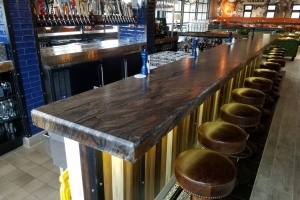 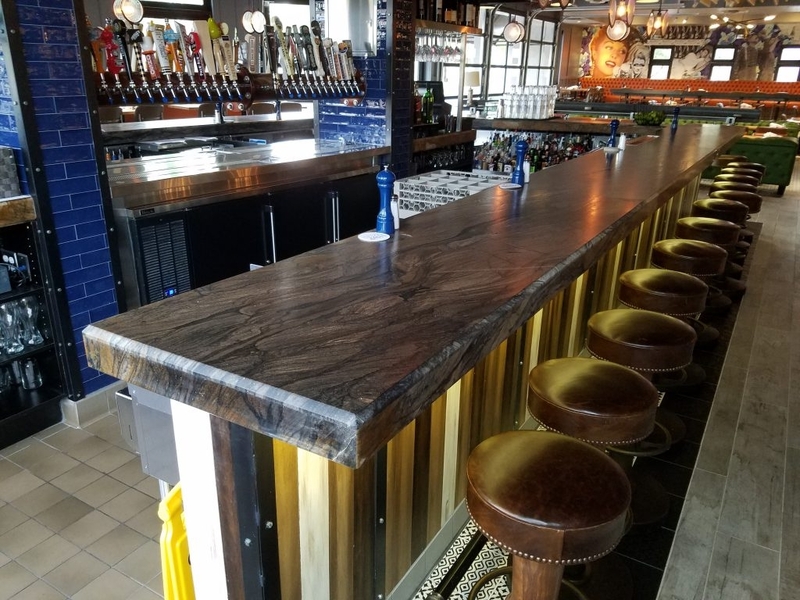 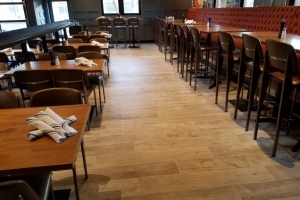 Hop Social Tavern is a restaurant which utilized a diverse amount of tile compositions, sizes and styles. 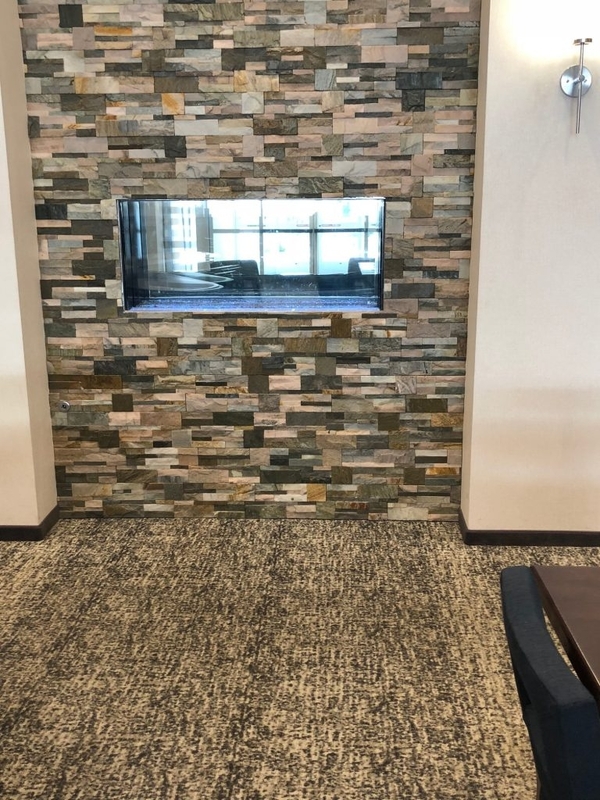 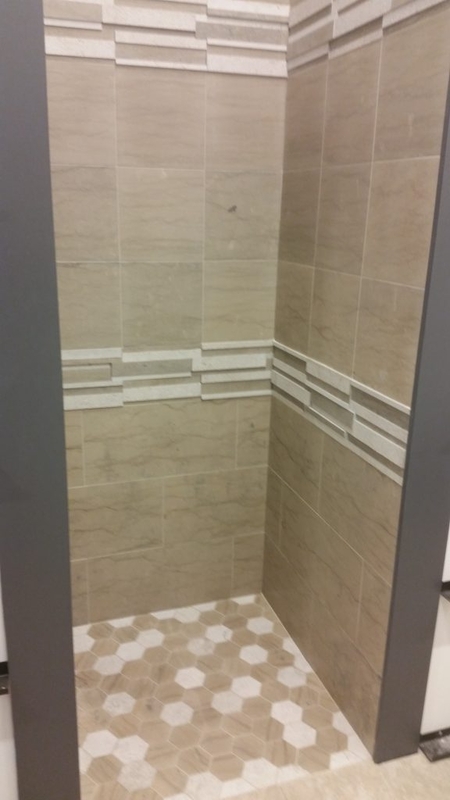 This installation consisted of over 15 different tile types ranging from quarry, glazed ceramics, porcelains to mosaics. 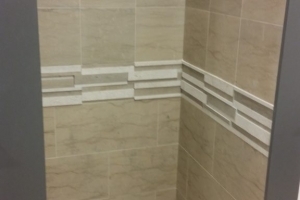 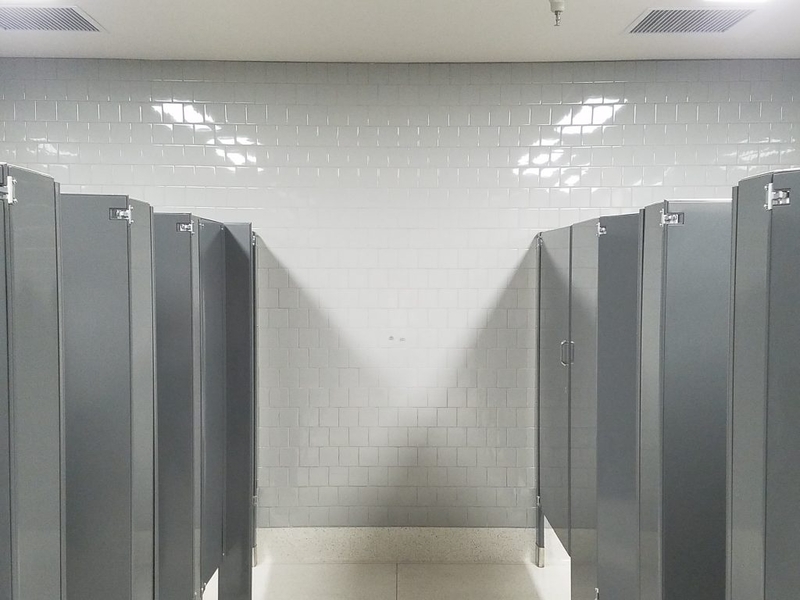 The transition between the tiles were not interrupted by typical commercial metal transitions but rather by tight jointed seams of the different tile types. 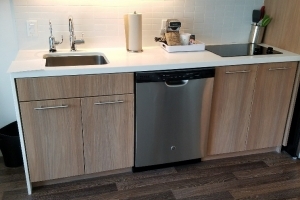 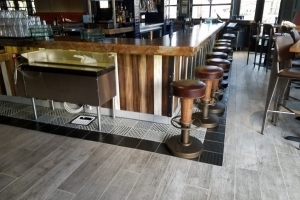 Dilex base metals were used instead of tile base coves, offering a nice accent to the vertical tiles. 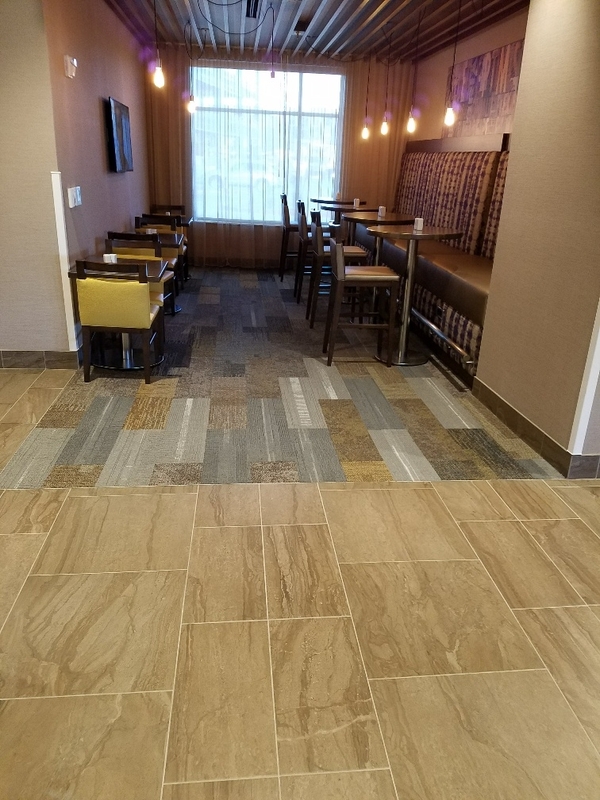 Garden Inn Hotel was a ground up, new build. 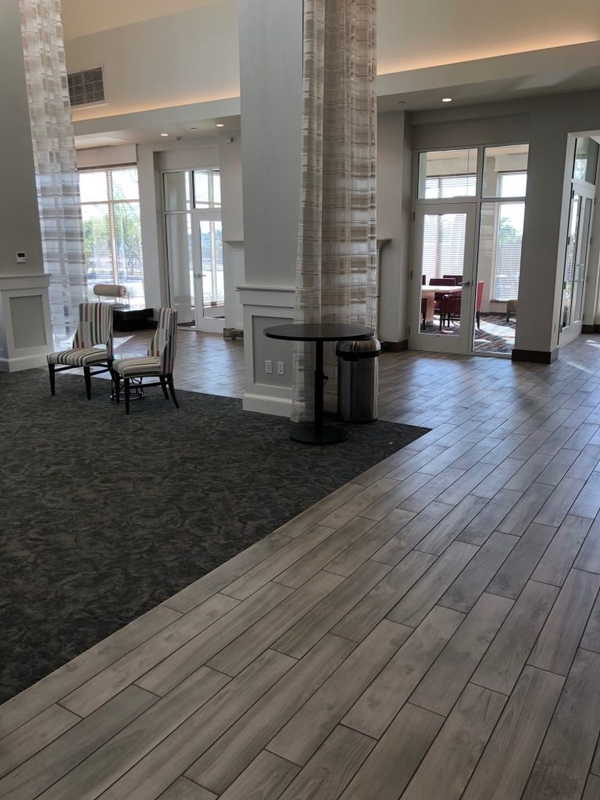 All 4 floors along with the 1st floor common areas consisted of: 40,000 Sq/ft of various tile formats throughout rooms, common areas and 1st floor. 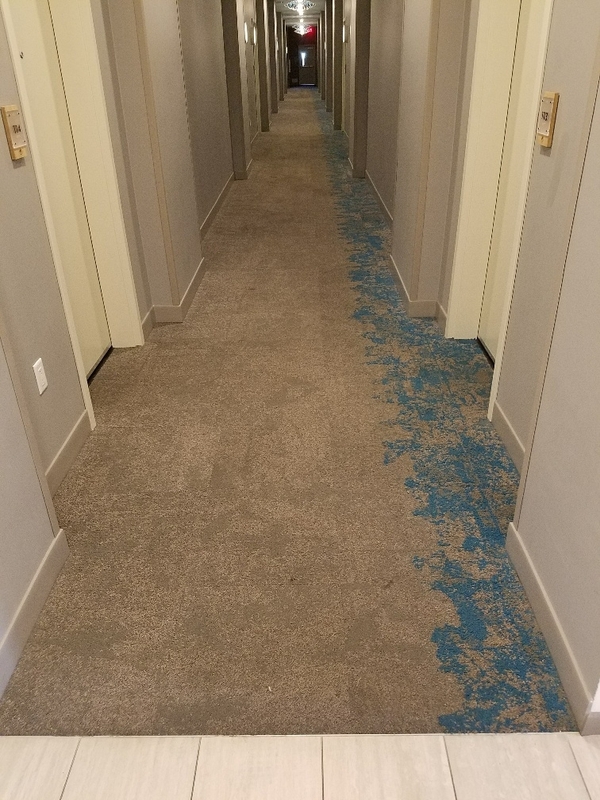 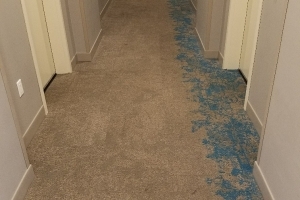 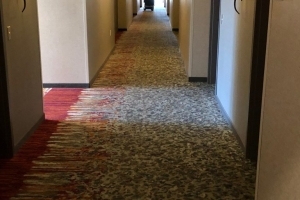 2200 Sq/yd of glue down carpet: 1600 Sq/yd of stretch in carpet and stair ways on both sides of hotel. 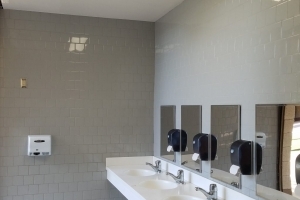 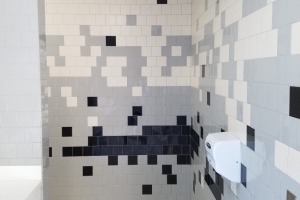 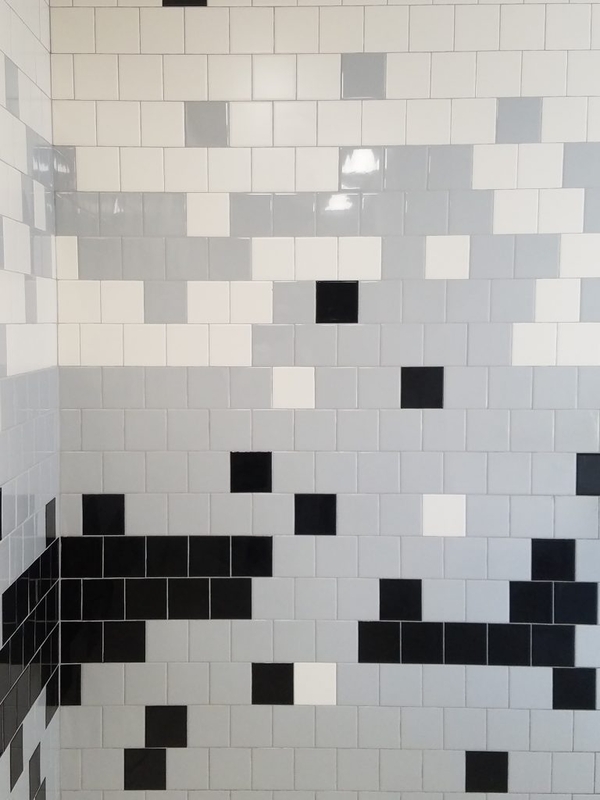 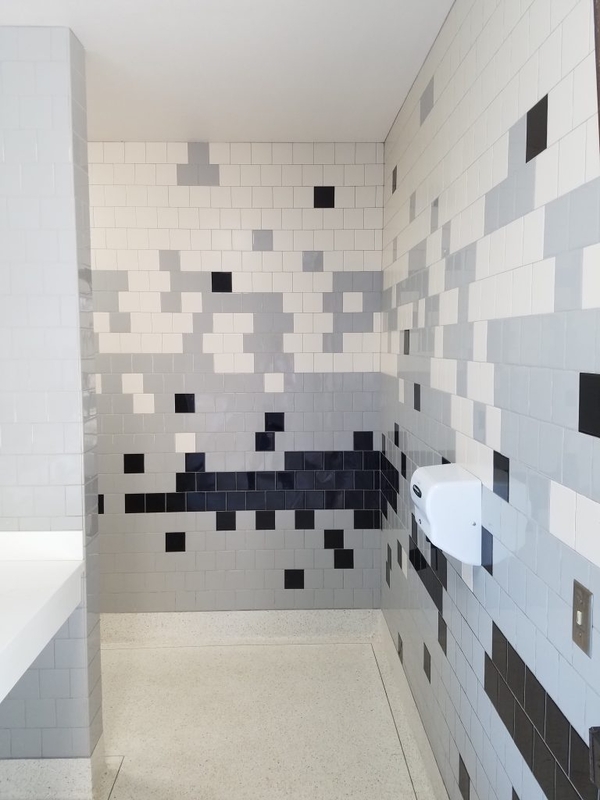 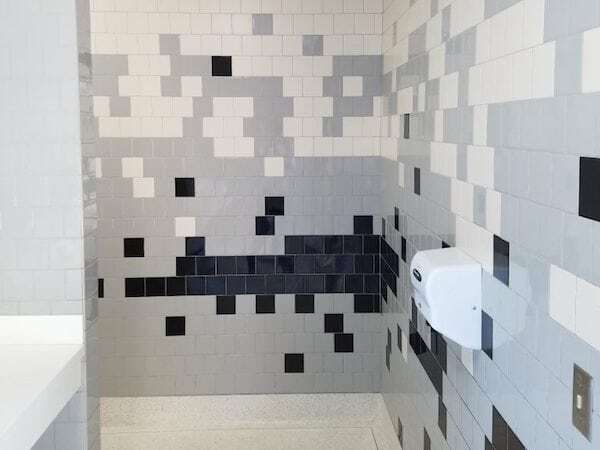 Ishikawa Elementary was a campus wide, bathroom remodel. 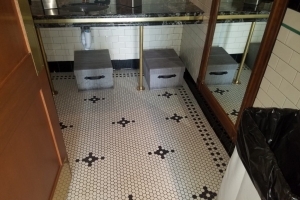 All the bathrooms consisted of various 4-1/4″ x 4-1/4″ glazed ceramic tiles with different color inserts and deco bands. 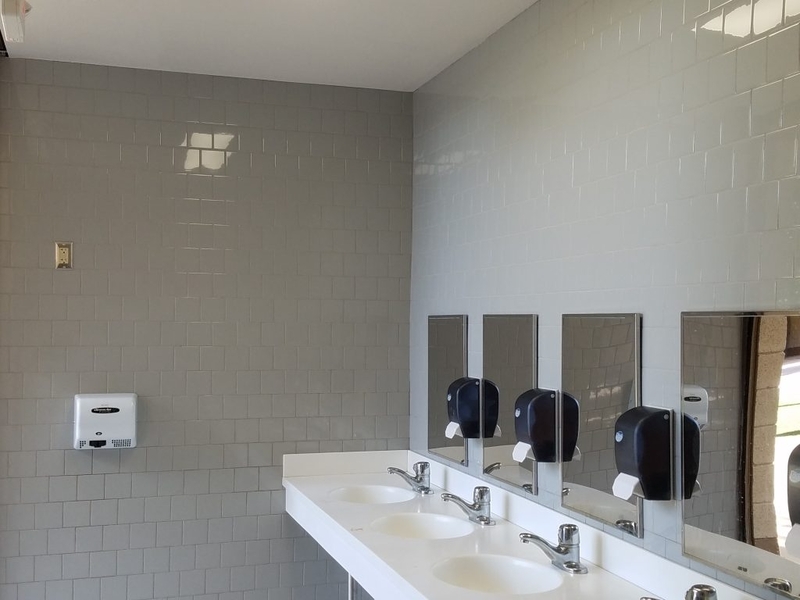 The bathrooms ranged from student to staff areas throughout the campus. 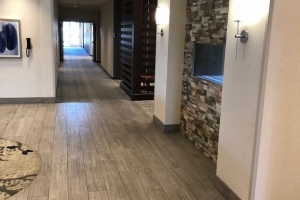 Homewood was a new build, ground up where ABS performed all flooring, from tile to carpet and everything in between. 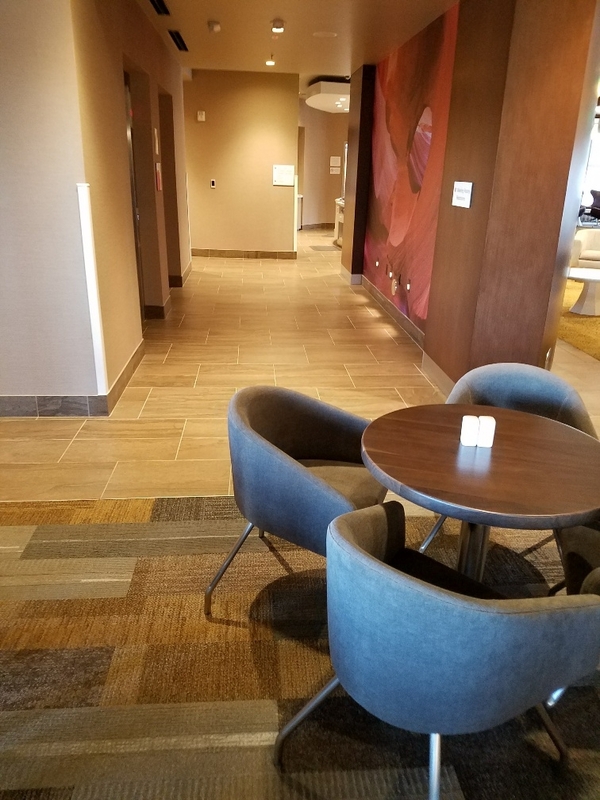 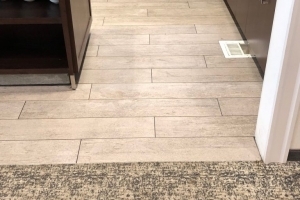 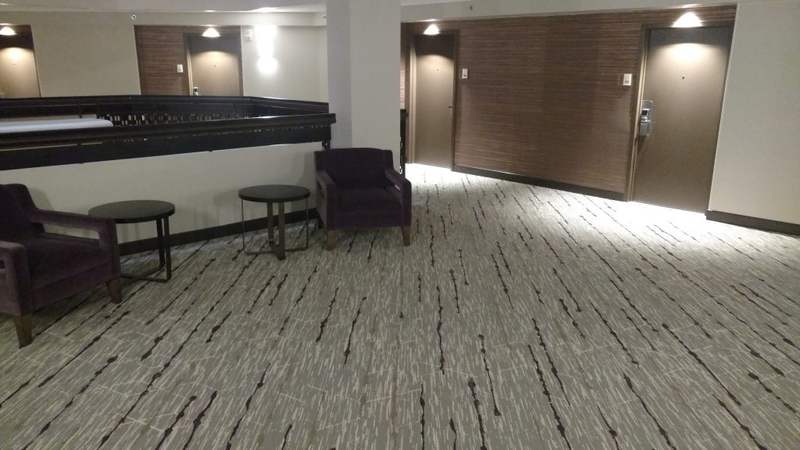 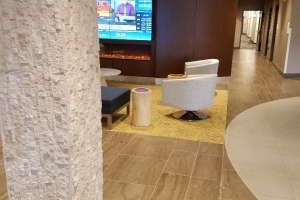 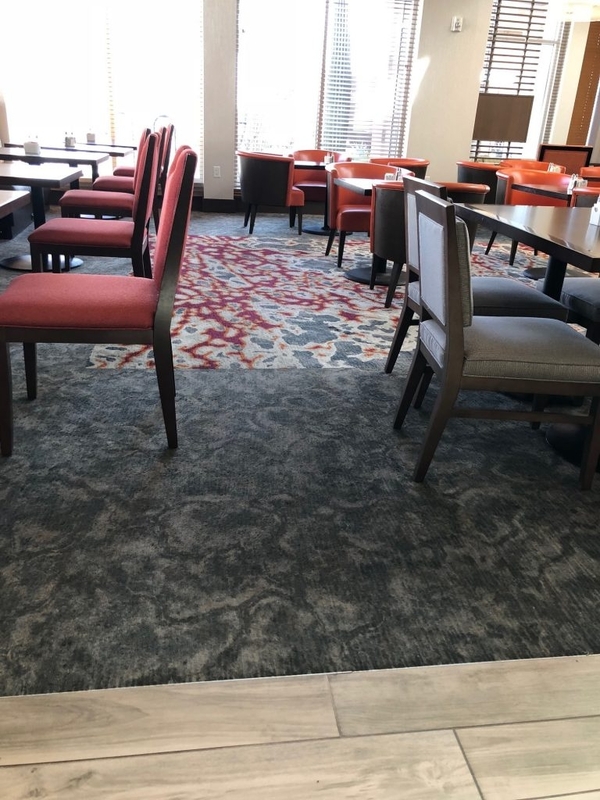 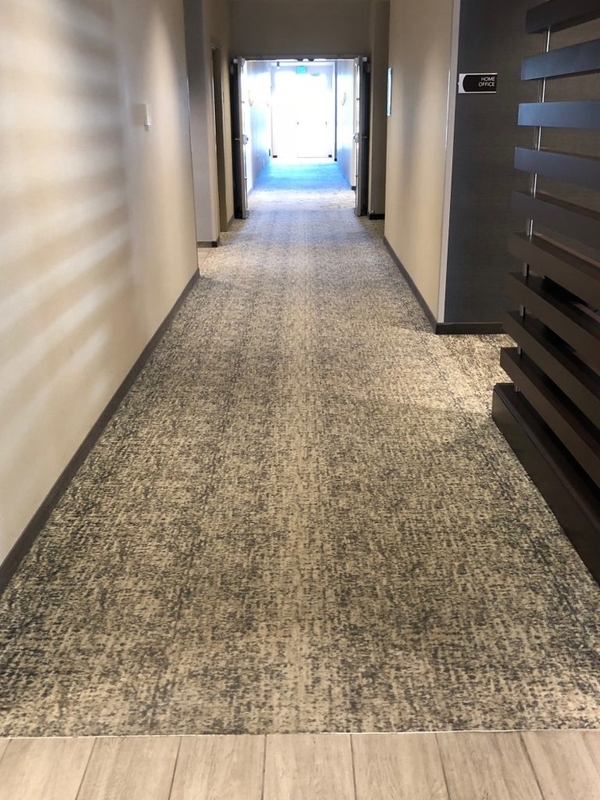 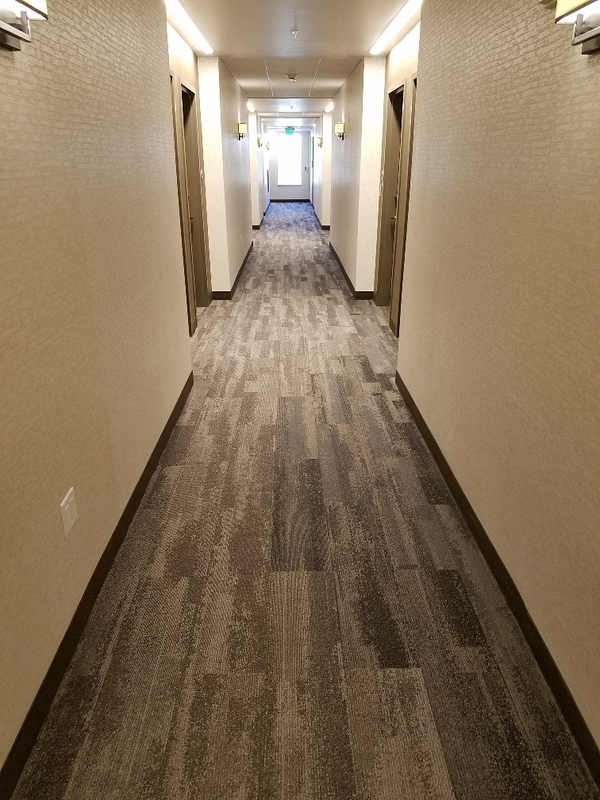 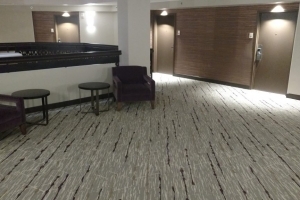 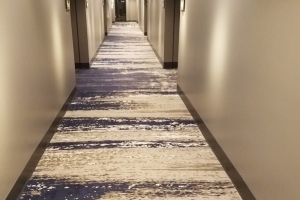 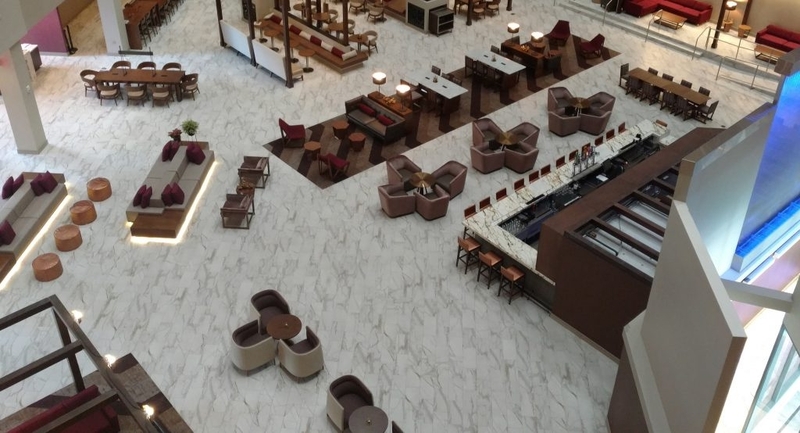 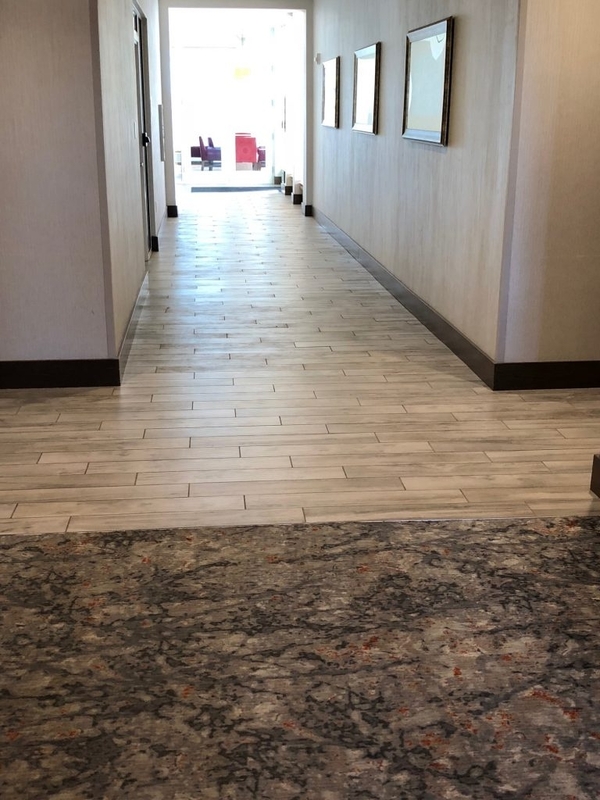 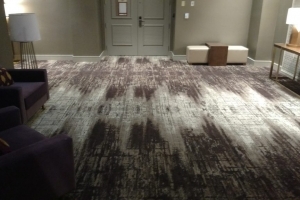 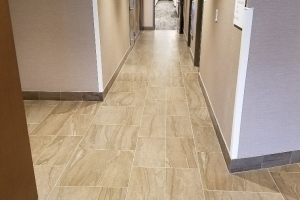 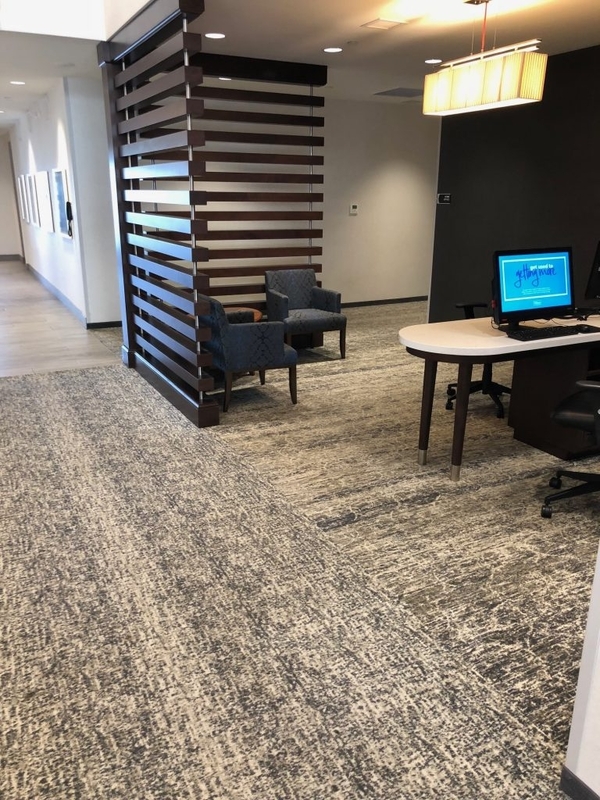 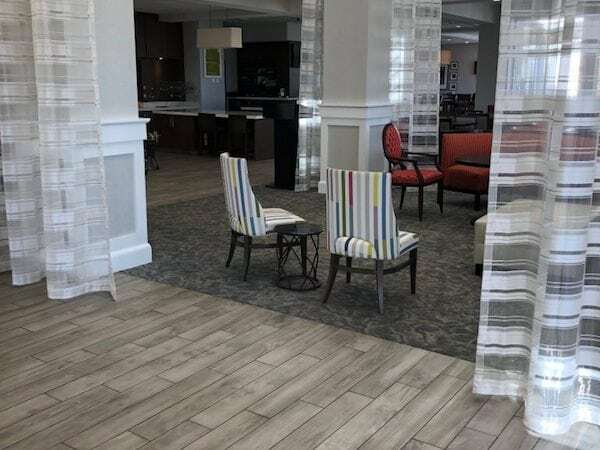 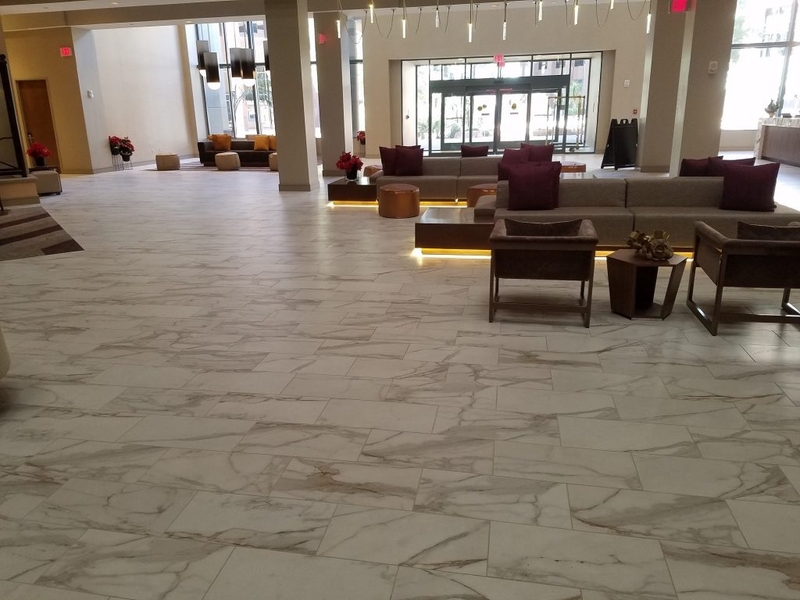 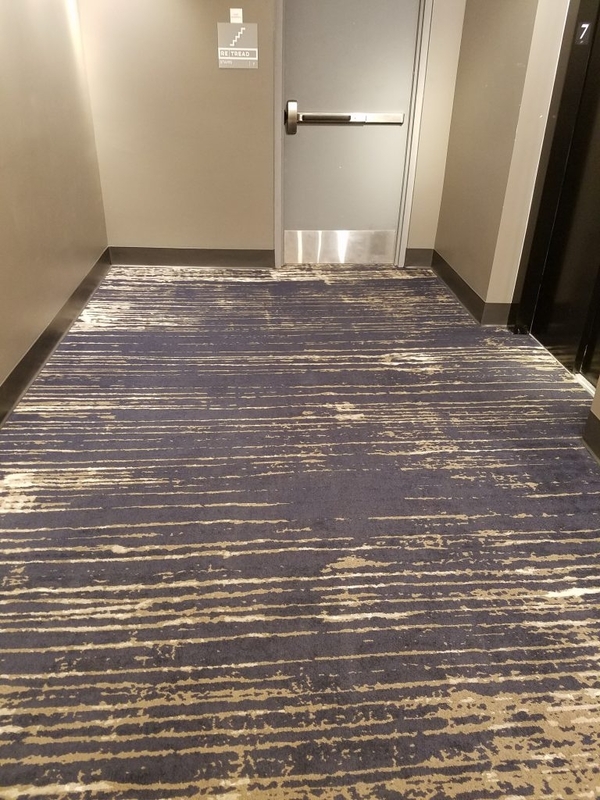 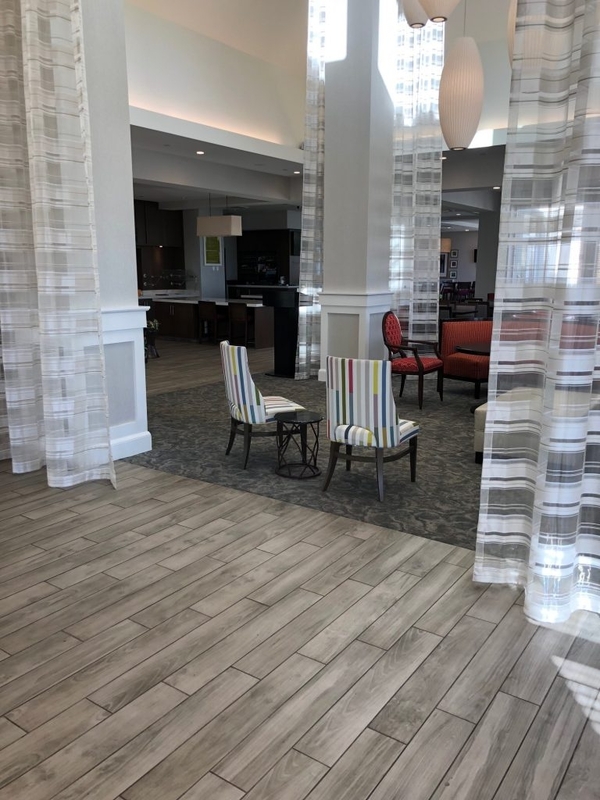 This project consisted of 4 floors of guestroom suites compiling over 2400 Sq/yd of double stick glue down carpet; over 5000 Sq/yd of guestroom stretch in carpet; 14,5000 Ln/ft of carpet base; over 27,000 sq ft of ceramic and mixed porcelain tile throughout the floors and main lobby areas. 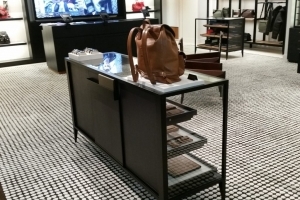 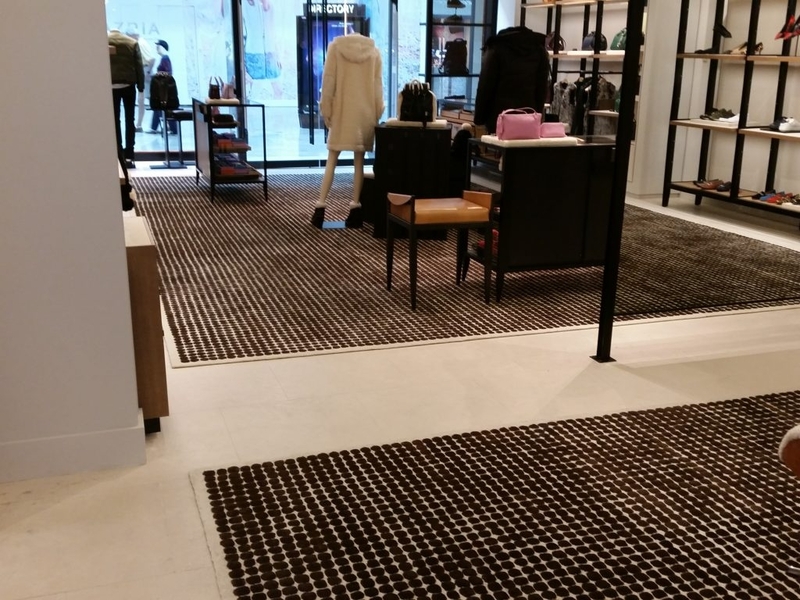 Coach Stores were performed at several different locations ranging from Arrowhead to Fashion Square Mall. 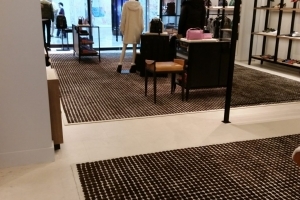 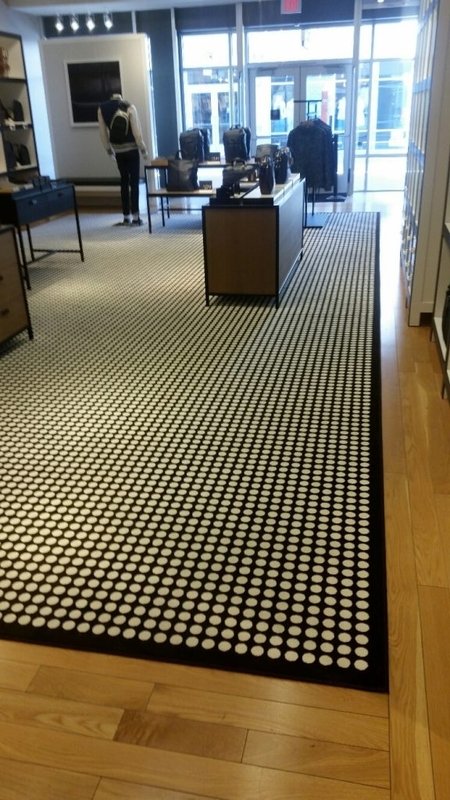 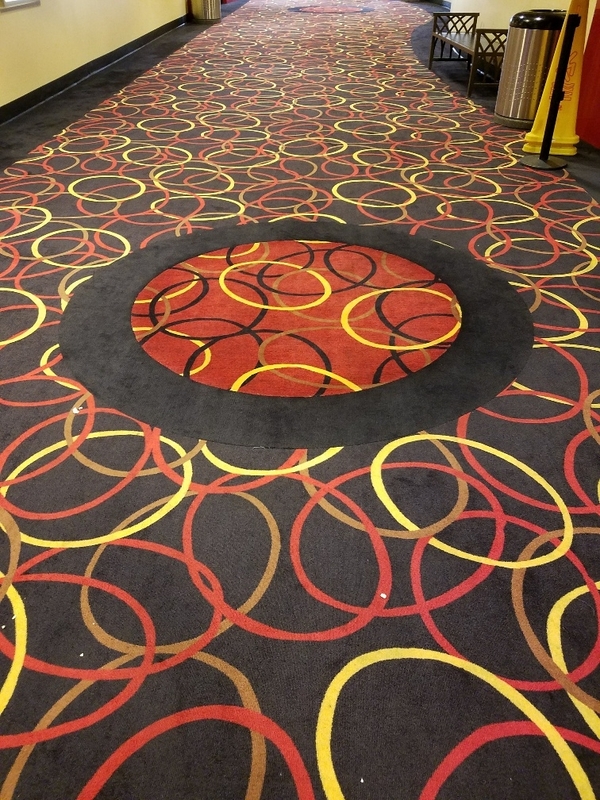 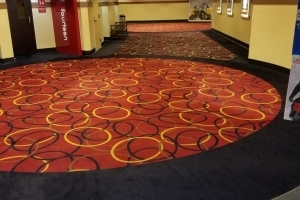 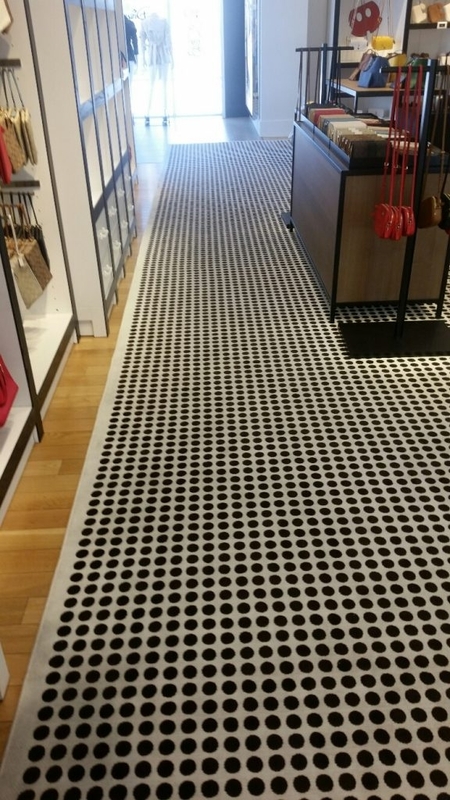 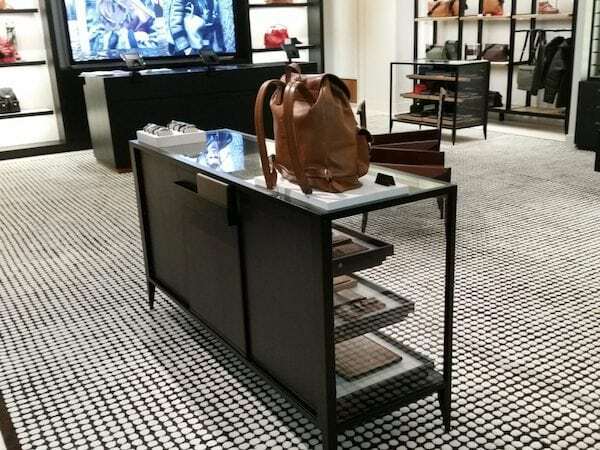 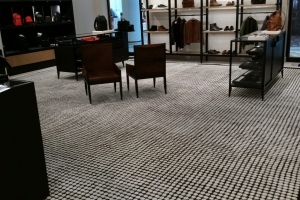 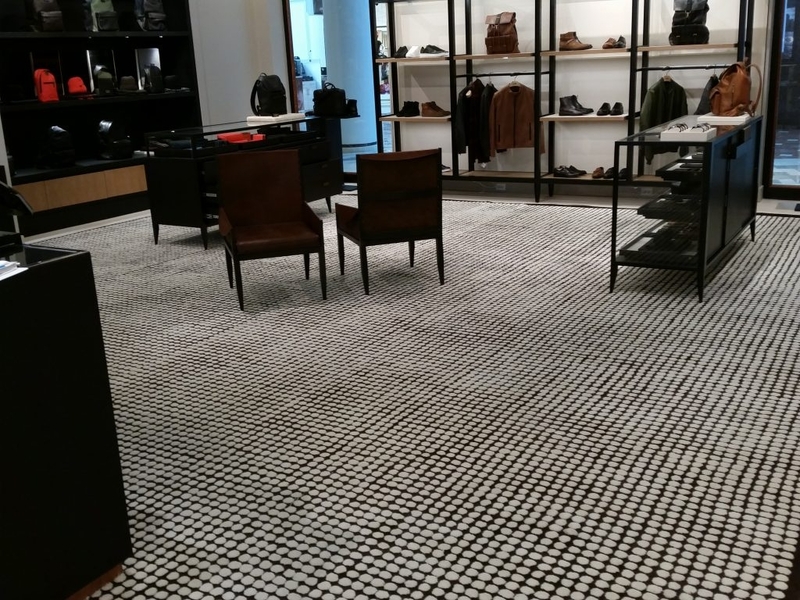 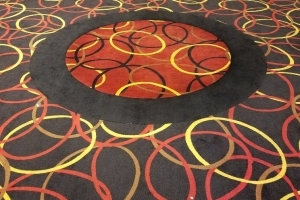 Each store consisted of 550 Sq/yd of patterned special custom rugs that required seaming per manufacturers diagrams and allowed very little variance due to the 1″ circles patterned throughout, as well as 350 Sq/ft 24×24″ granite tile throughout certain stores. 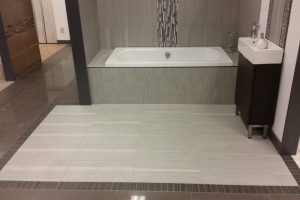 CSL Plasma consisted of 6000 Sq/ft of Forbo luxury vinyl tiles along with 1300 Sq/ft mixed ceramic tiles in bathroom floors and walls. 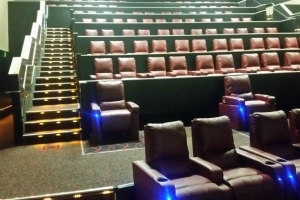 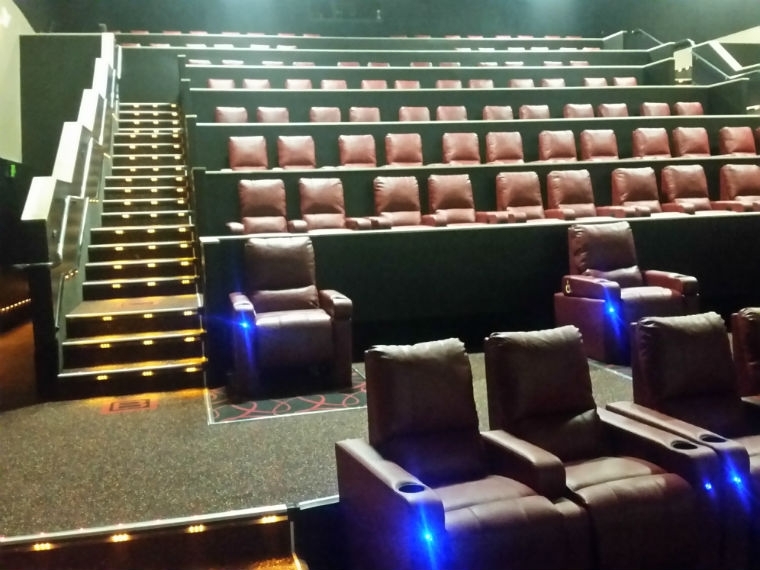 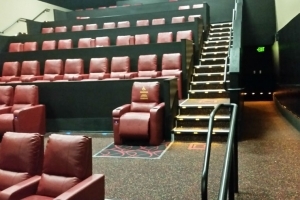 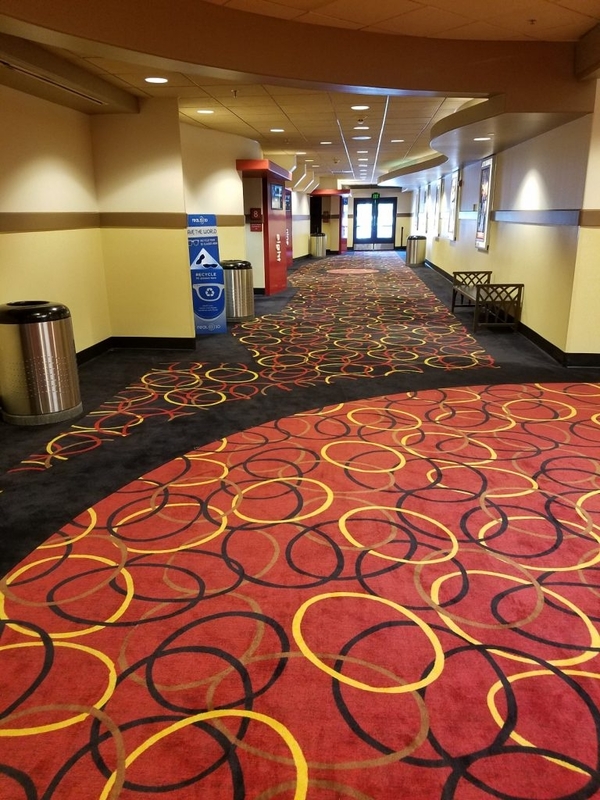 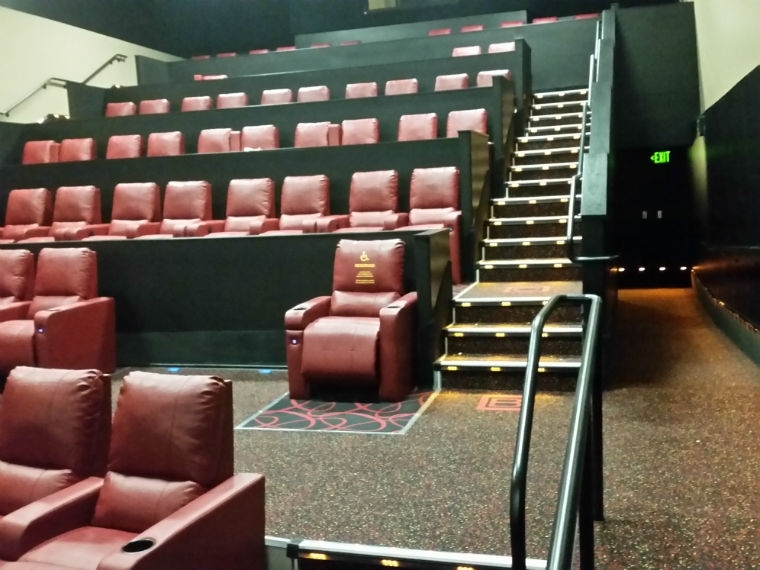 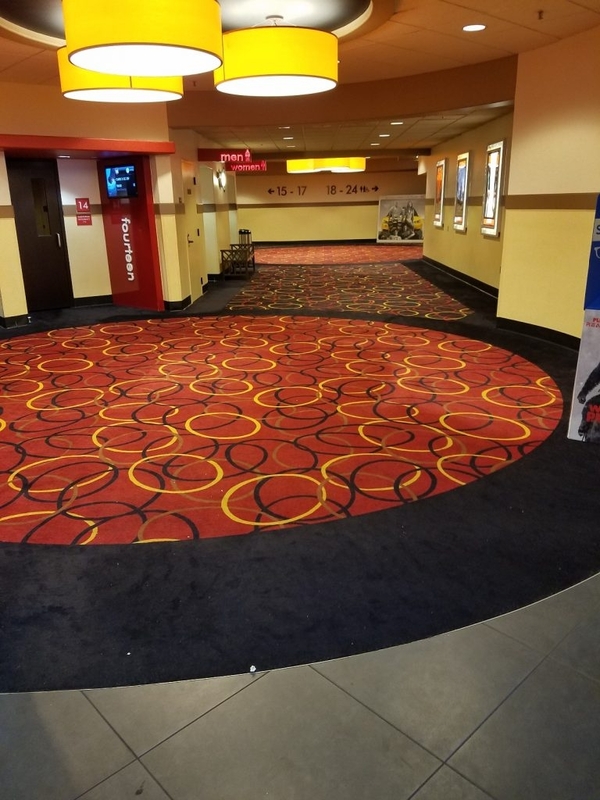 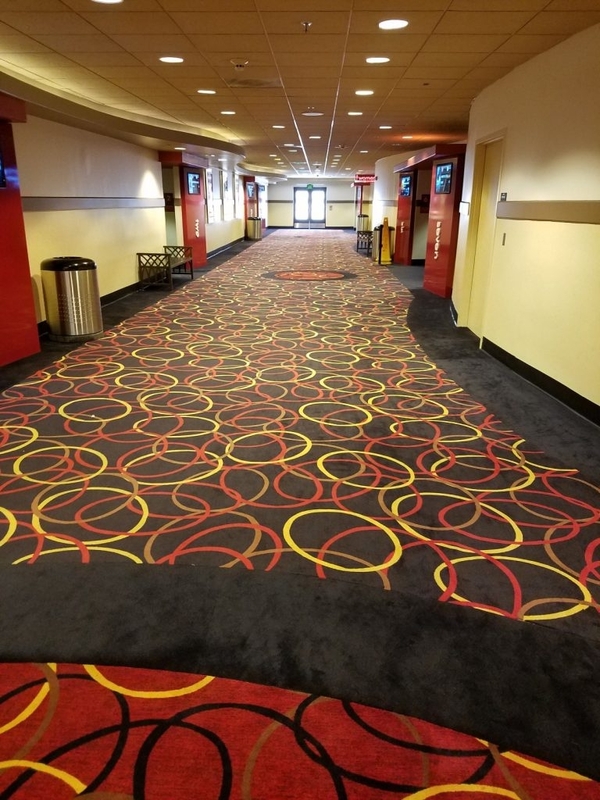 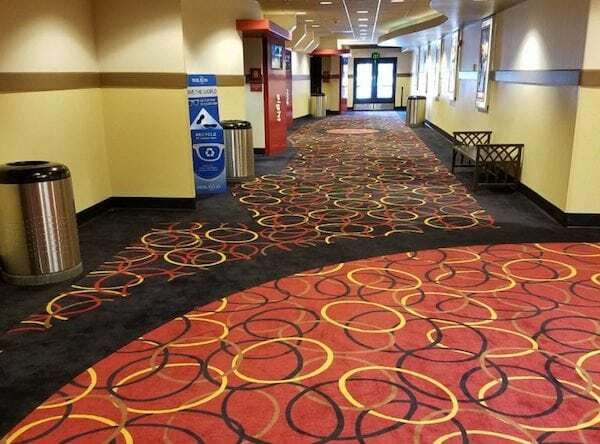 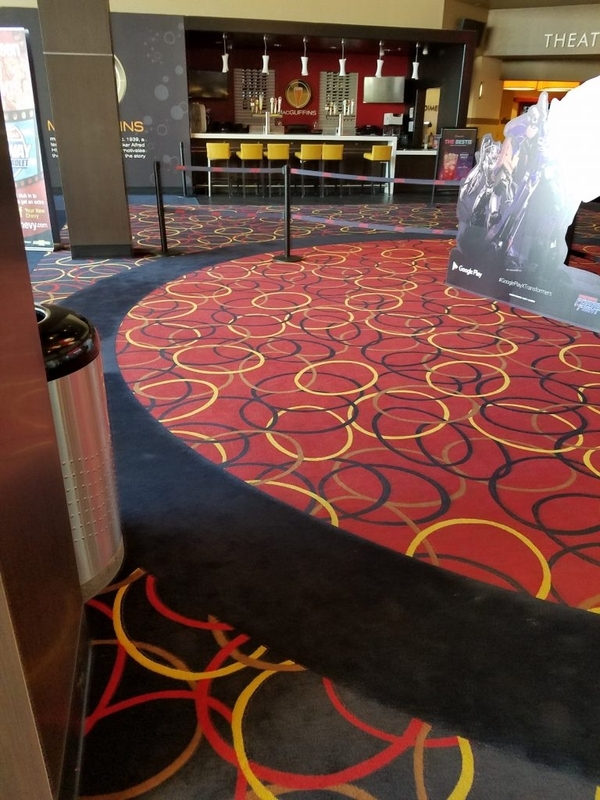 AMC Awhatukee was a 24 auditorium full remodel. 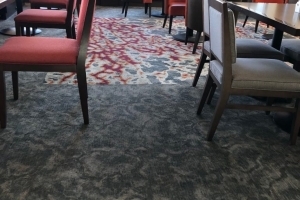 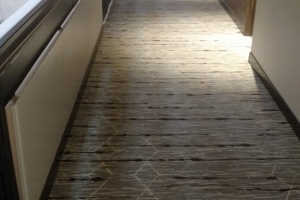 The install consisted of 12000 Sq/yd of broadloom glue down patterns and inserts. 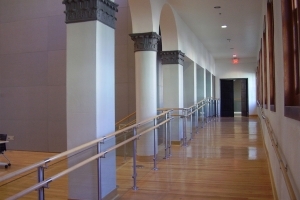 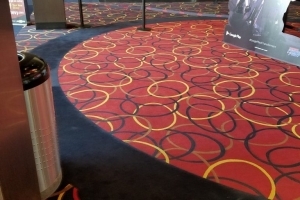 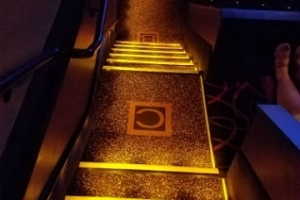 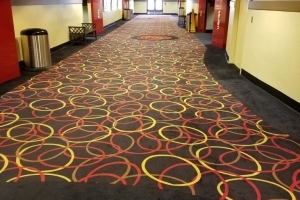 The auditoriums had carpeted walls along with customized stairs, wraps and insets at every platform level. 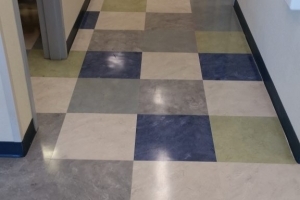 The array of geometric inserts extended out to the common area walkways. 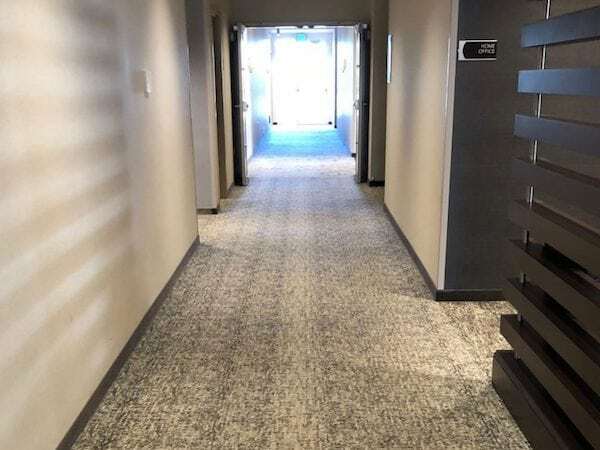 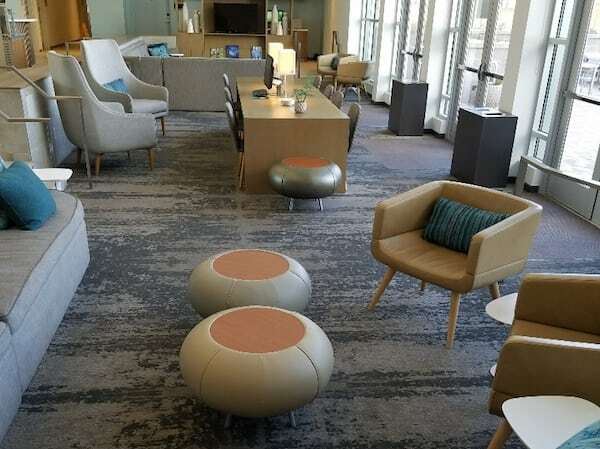 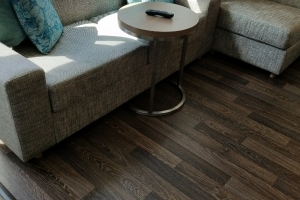 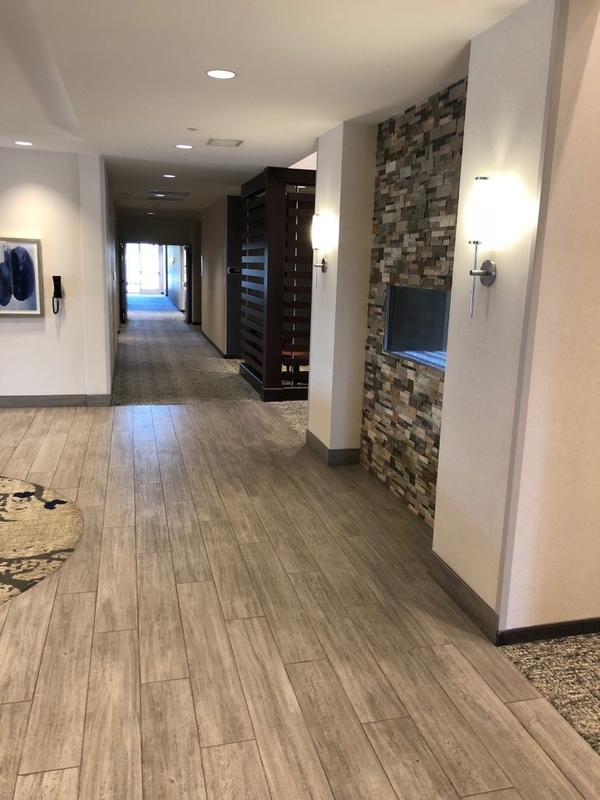 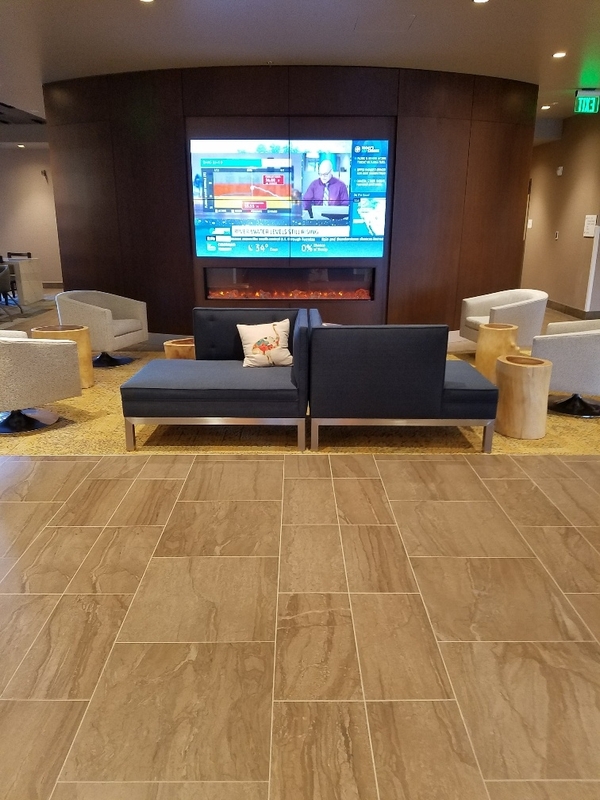 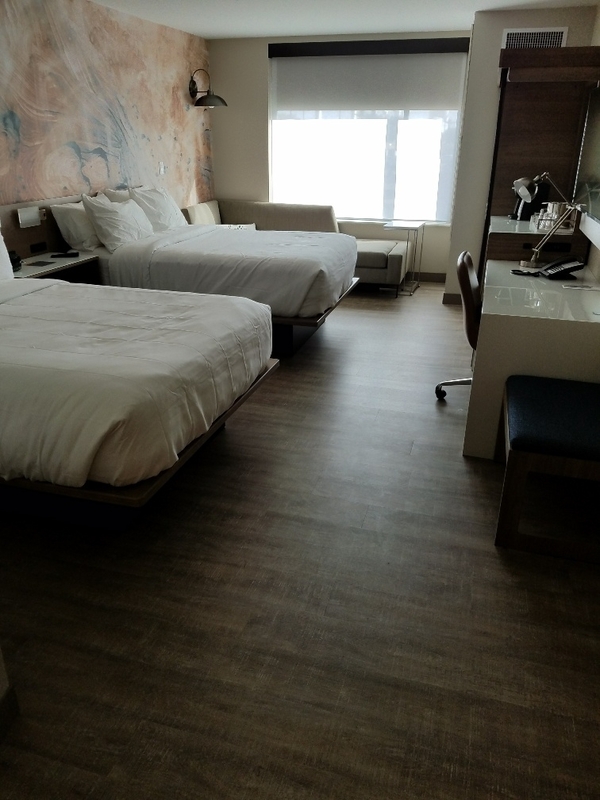 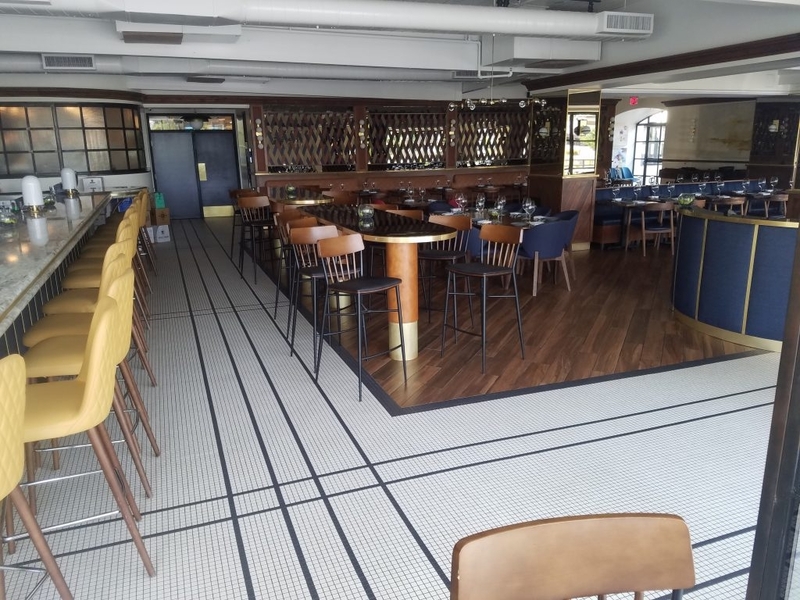 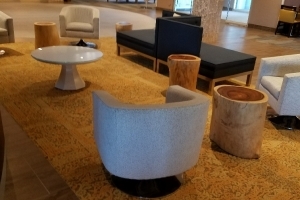 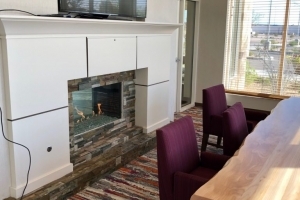 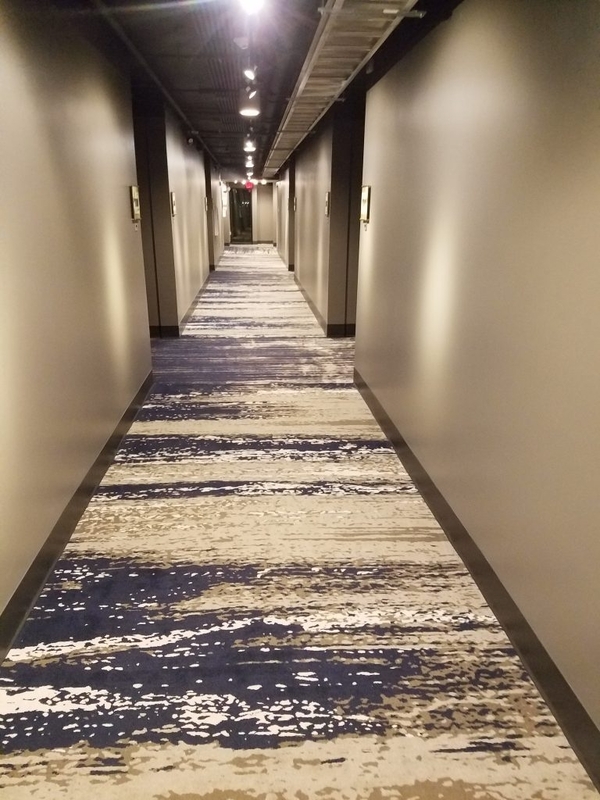 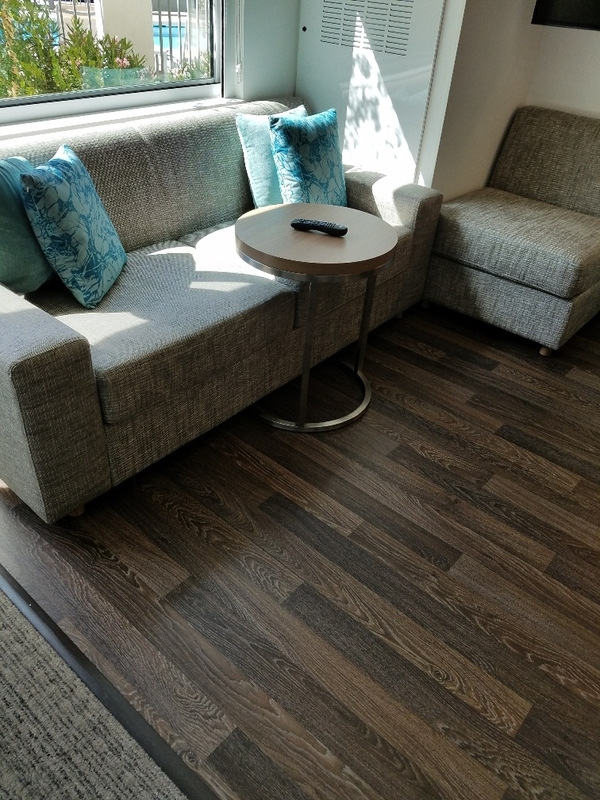 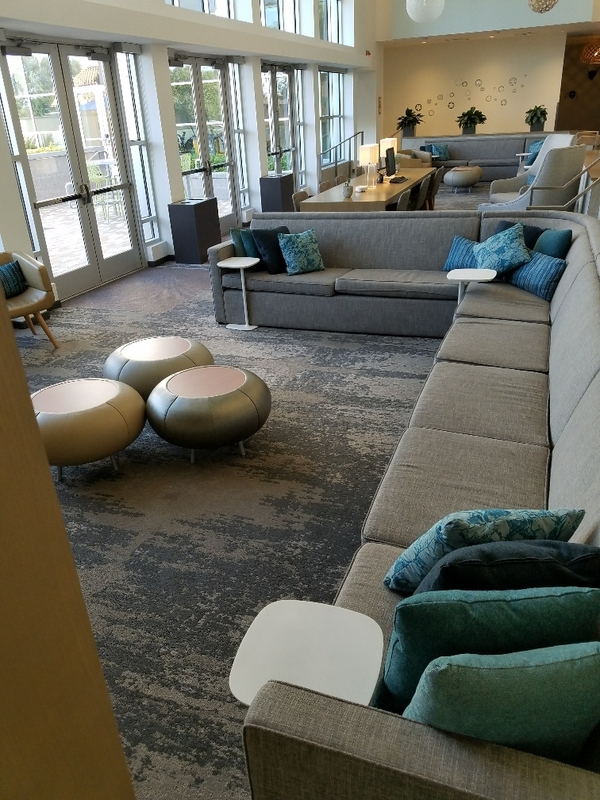 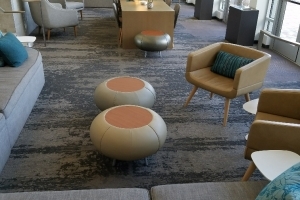 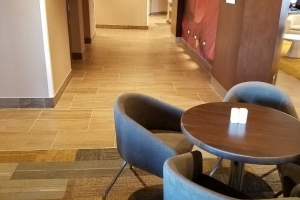 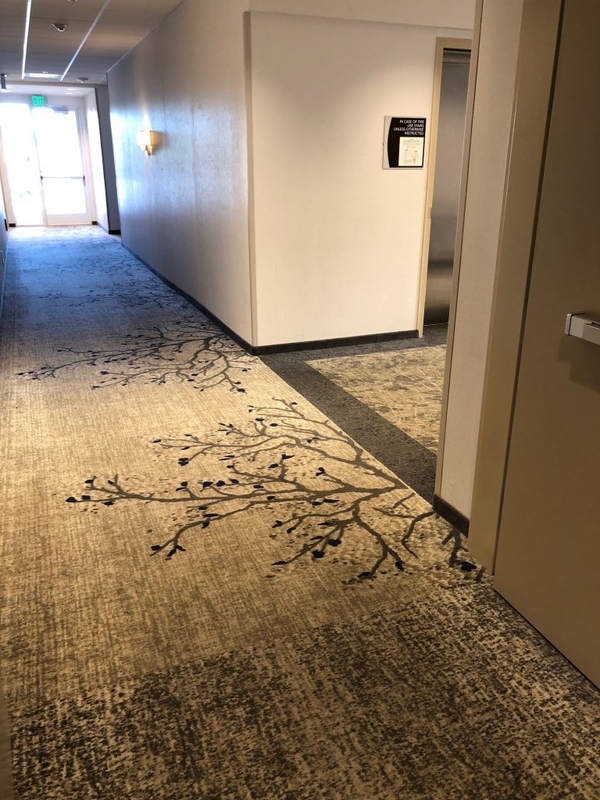 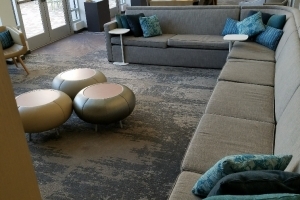 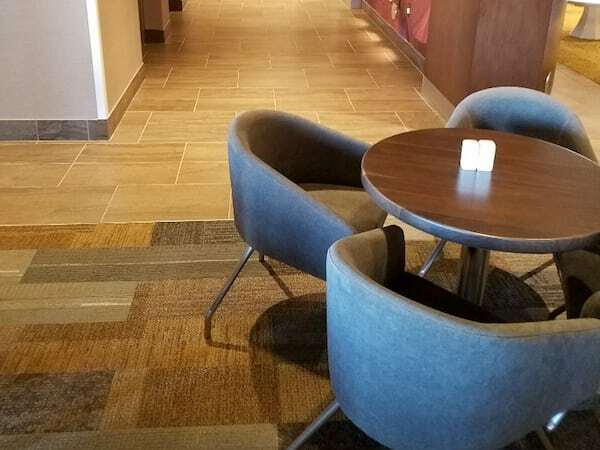 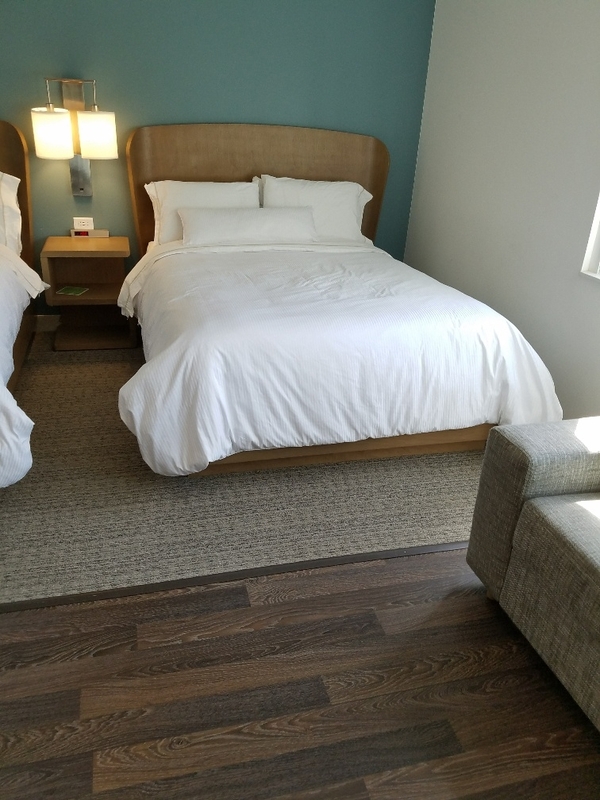 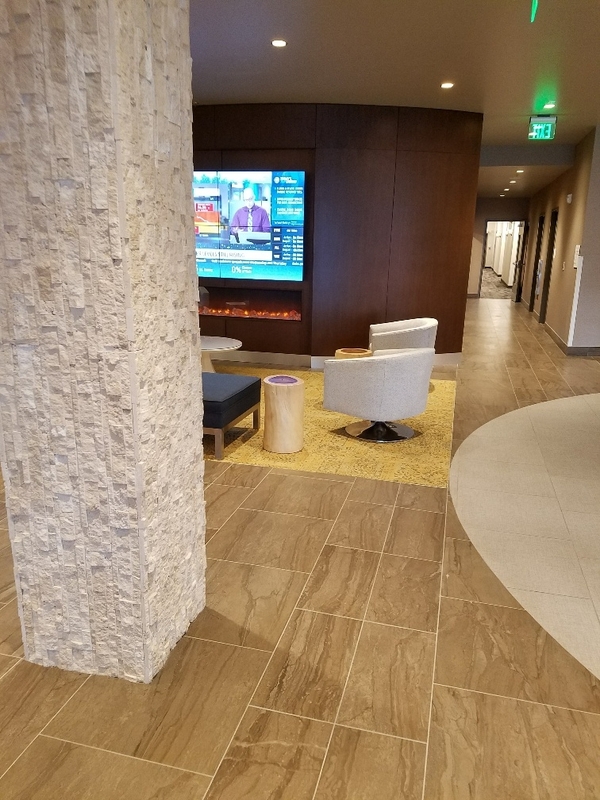 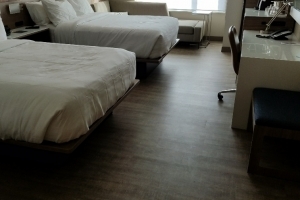 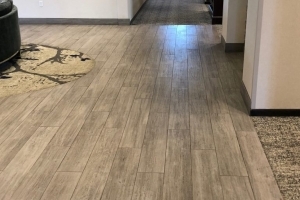 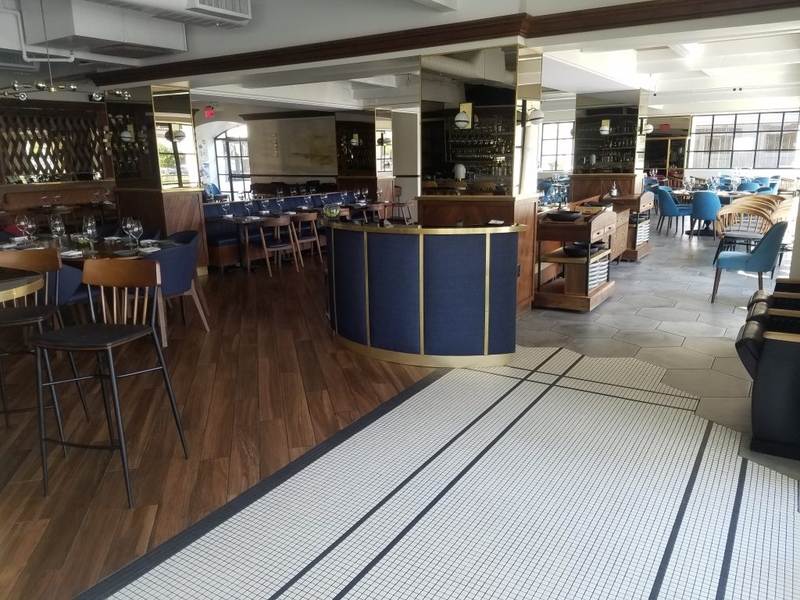 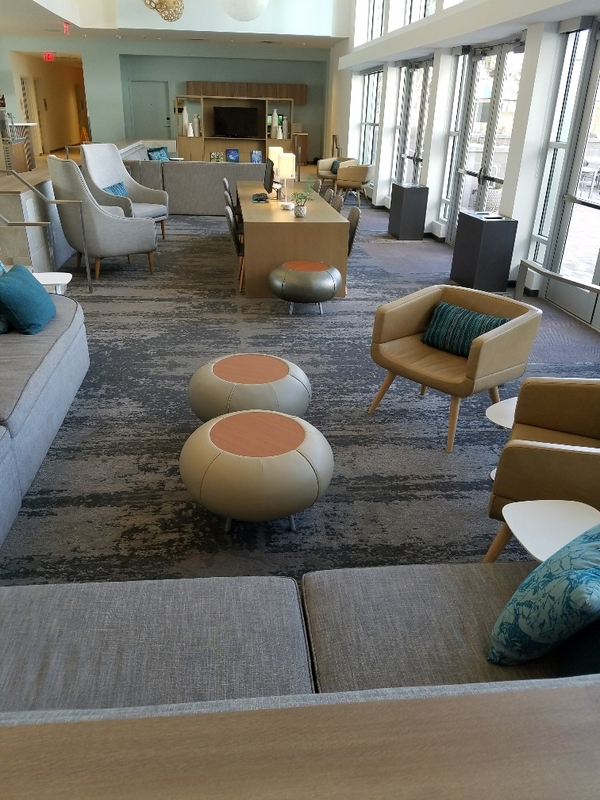 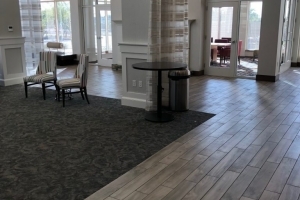 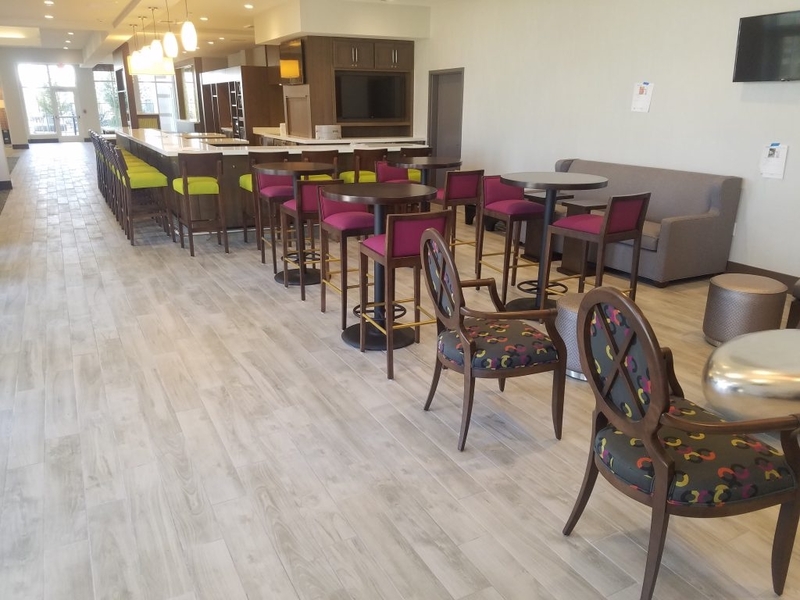 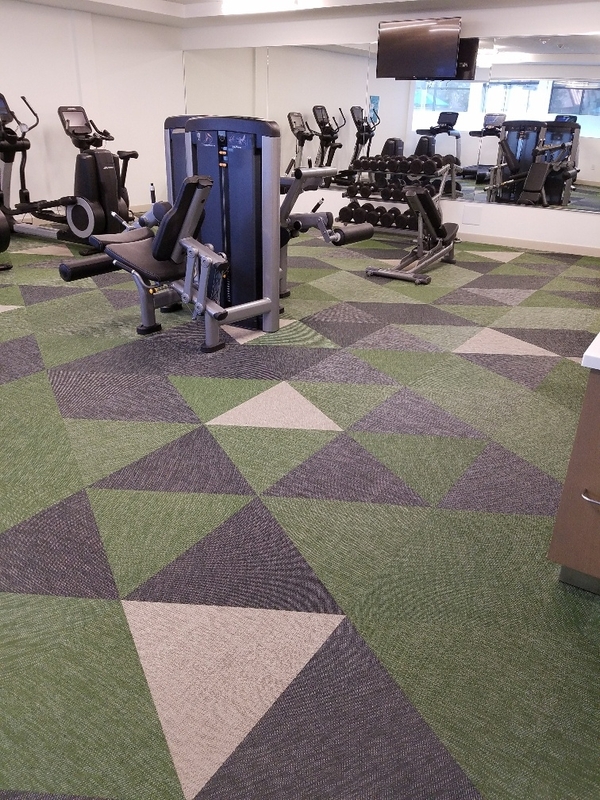 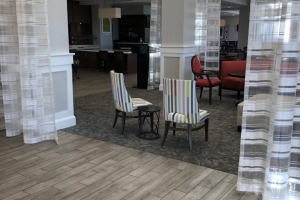 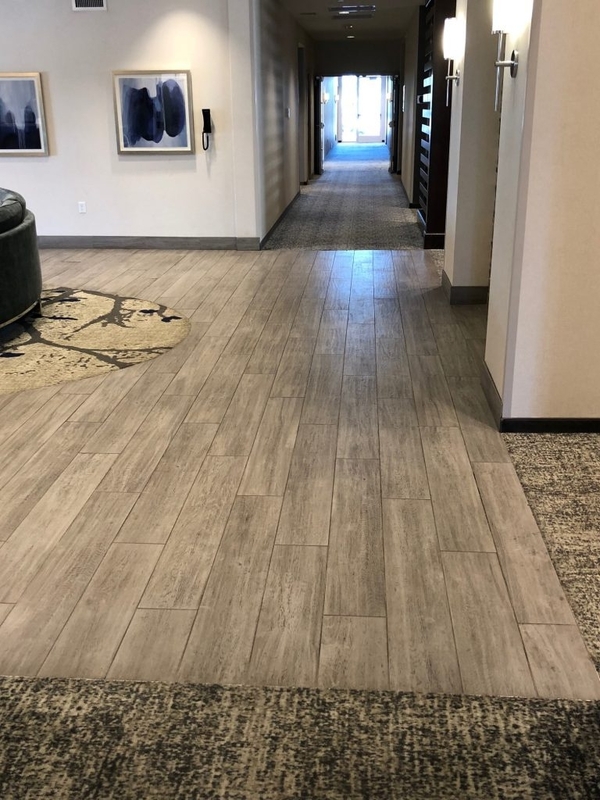 Element Hotel in Chandler consisted of 4 floors of over 2,300 Sq/yds of inlaid sheet vinyl with pvc underlayment at all the guestrooms, along with over 2000 yards carpet tiles and over 7,000 linear ft of millwork base throughout common areas and guest rooms. 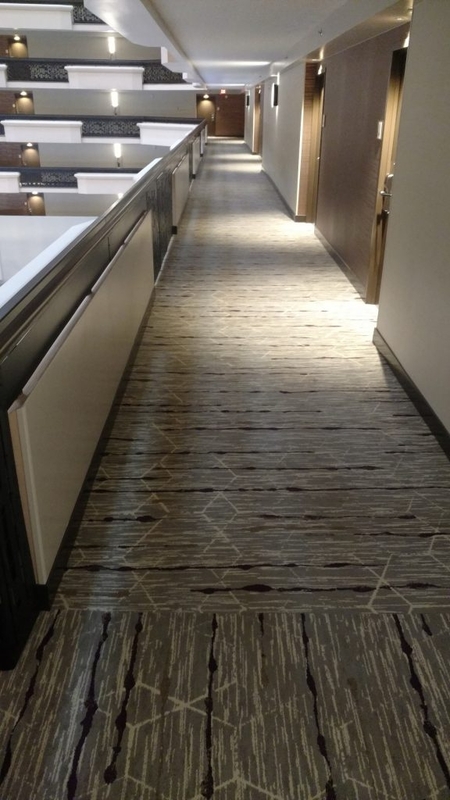 The 1st floor areas consisted of sheet vinyl, double stick carpet, glue down broadloom and some epoxy flooring. 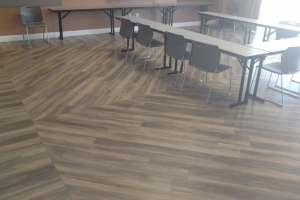 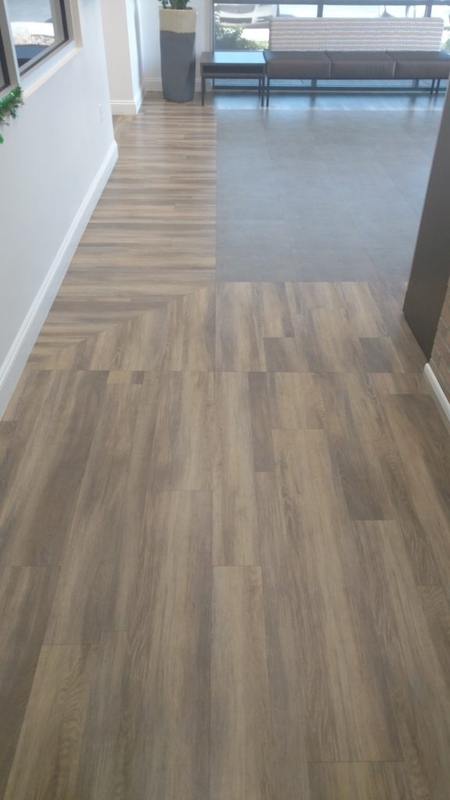 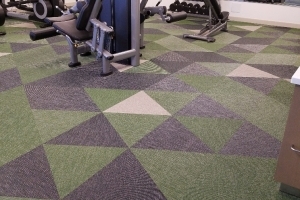 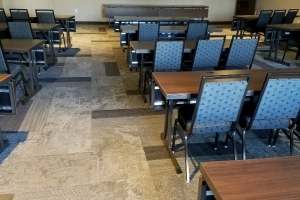 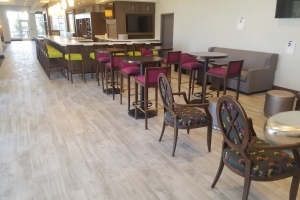 Aeroterra Community Center was an installation consisting of over 8,000 sq feet of Luxury vinyl plank and vinyl tile. 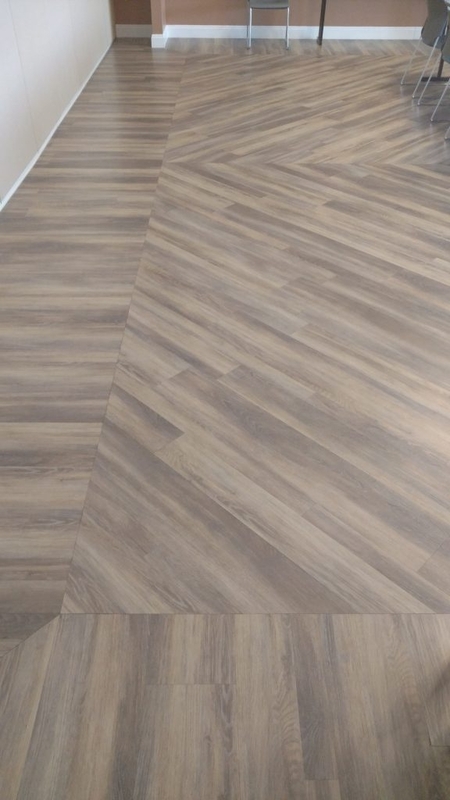 Layout orientations varied according to their area designations as well as impacting the direction of the planks with tiles inset. 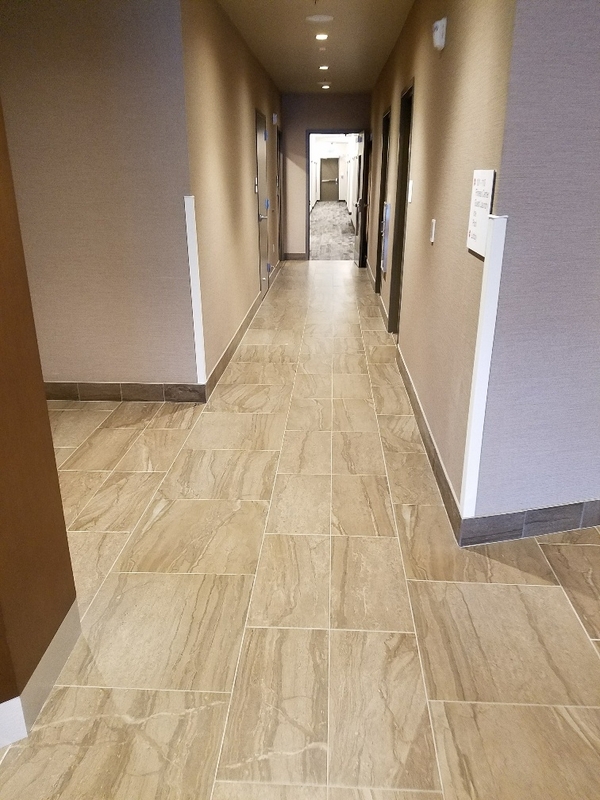 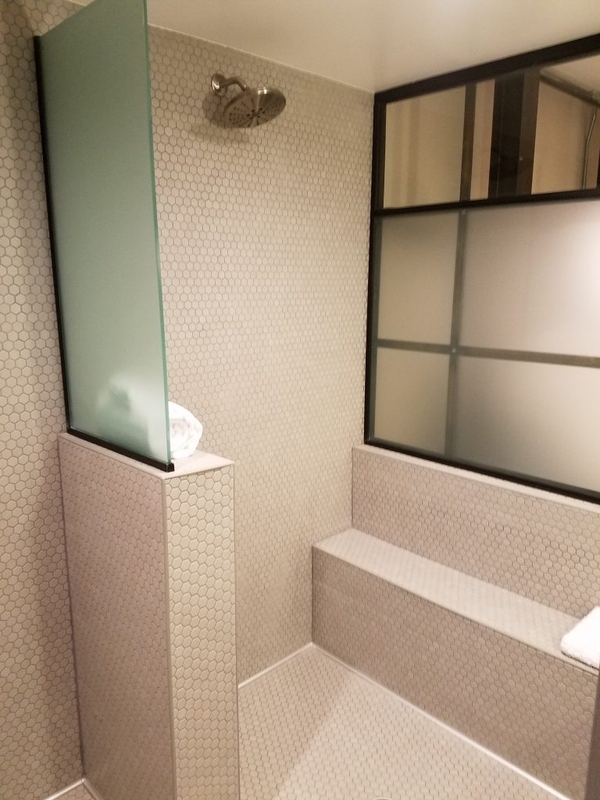 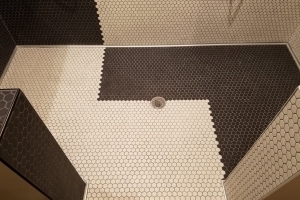 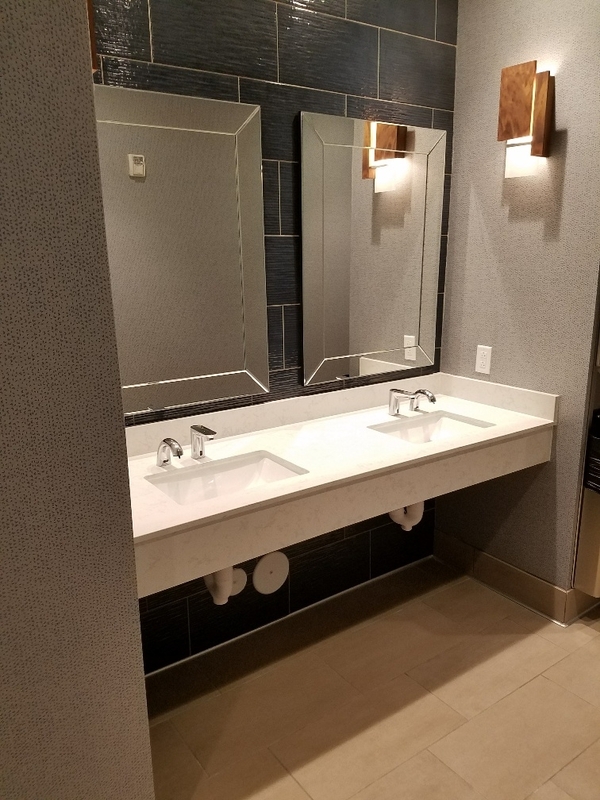 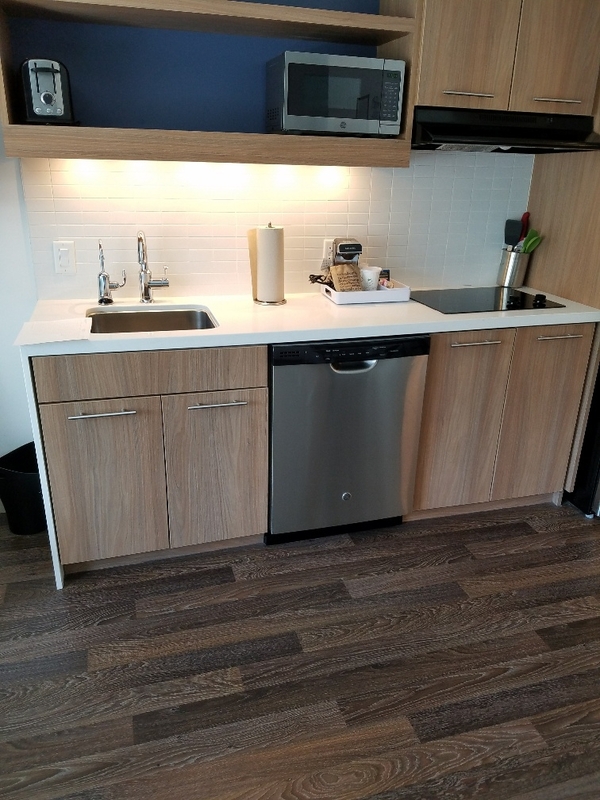 11 story remodel that consisted of over 200 guest rooms with hexagon porcelain tiles at all unit entries and bathroom floors and showers along with tub surrounds. 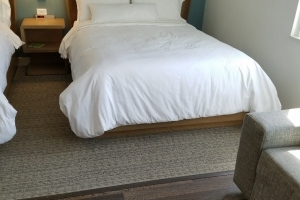 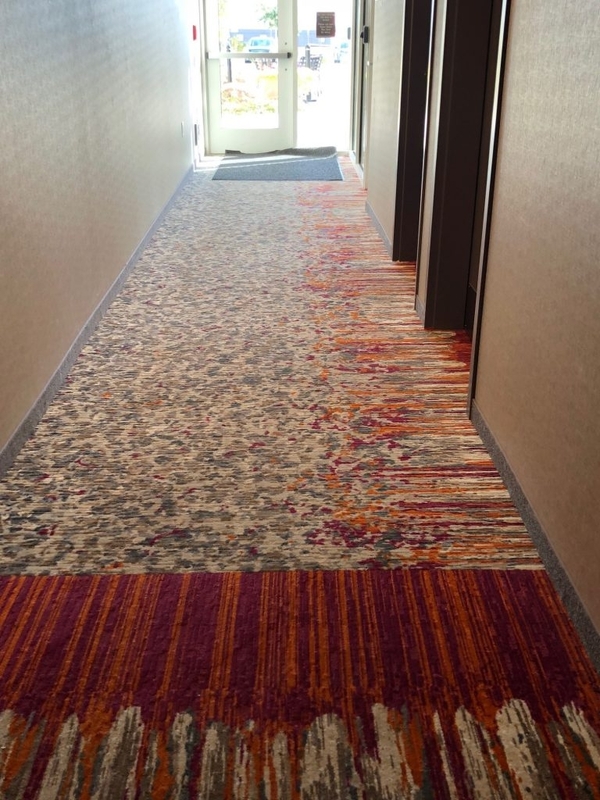 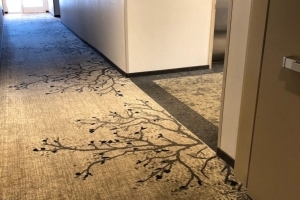 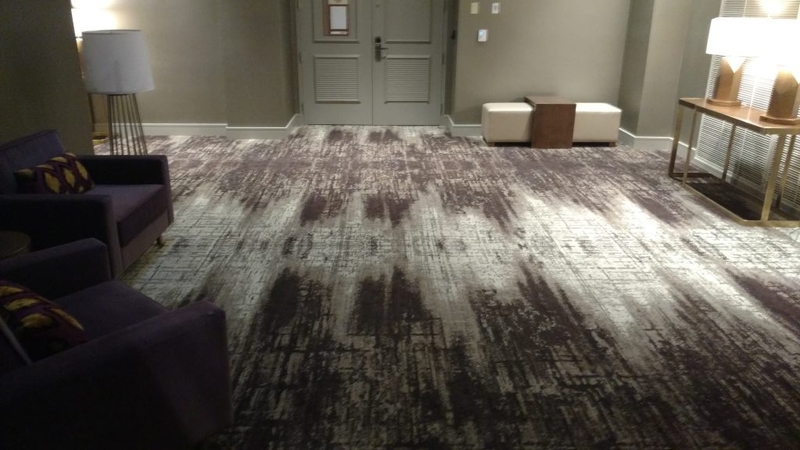 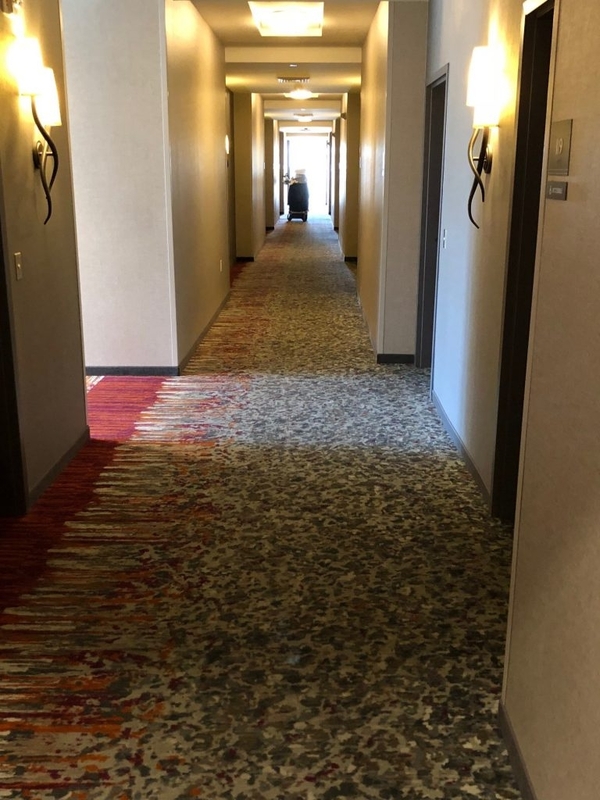 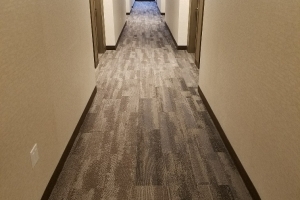 Double stick carpet at hallways, 12×24 at common areas on guestroom floors. 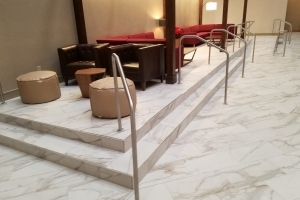 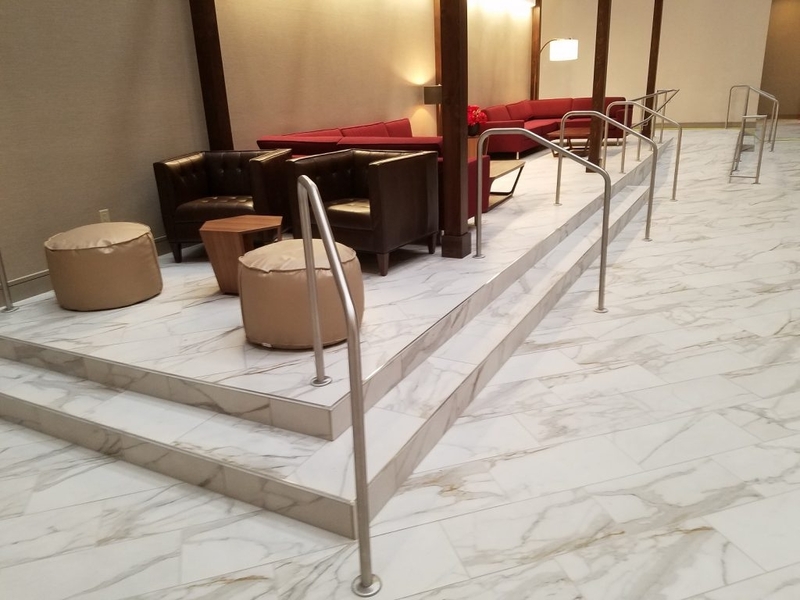 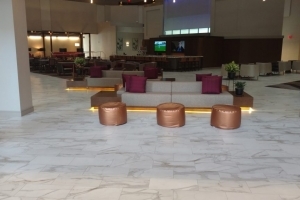 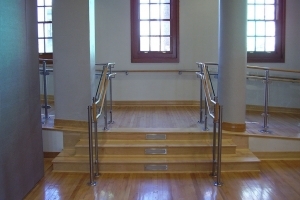 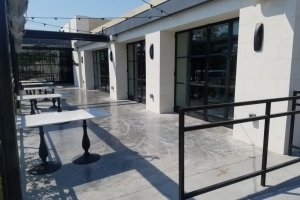 Main lobby was over 12K square feet of 12×24, porcelain tiles planks along with planks on walls, metal tiles over bar, and metal trim, wrapped steps and ramp transitions. 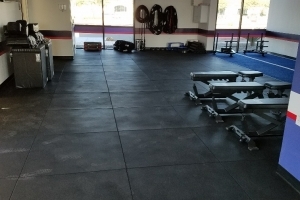 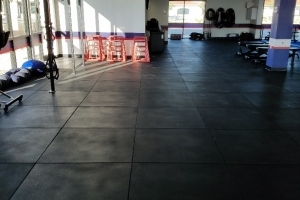 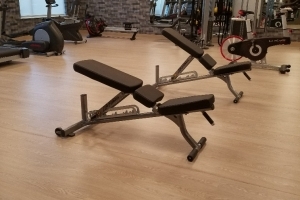 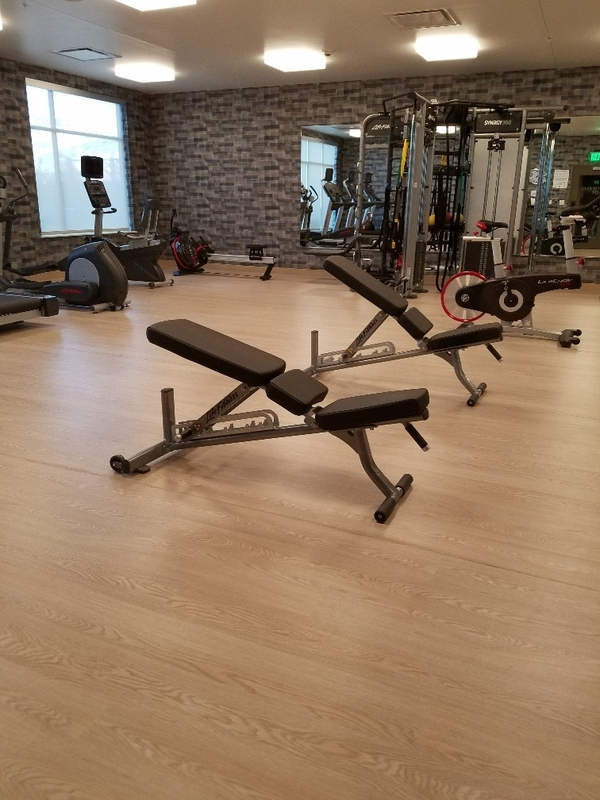 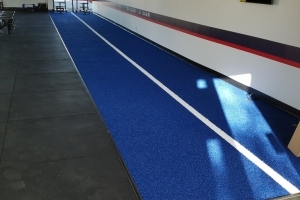 Rubber / vinyl flooring at fitness area. 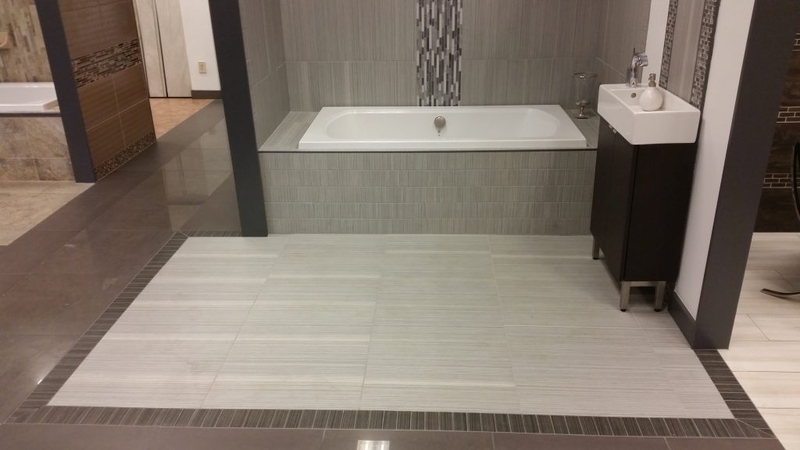 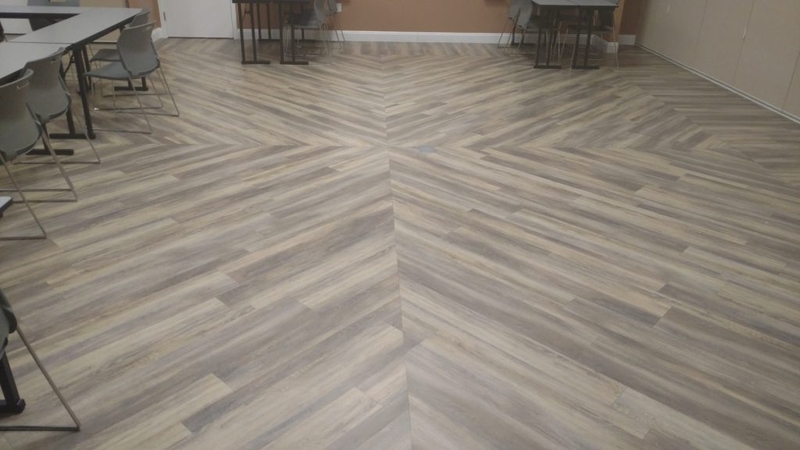 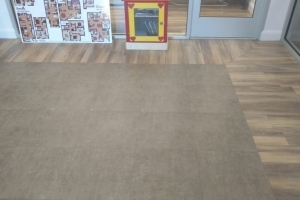 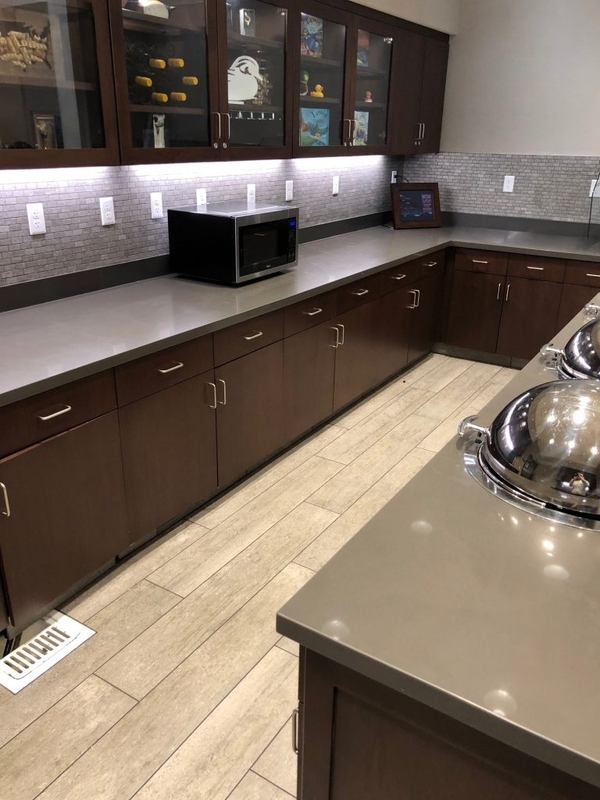 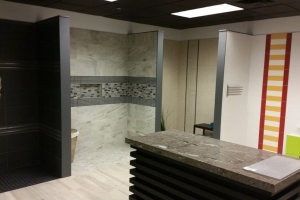 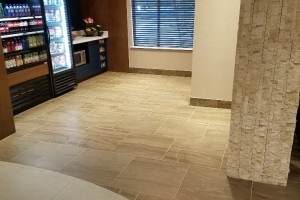 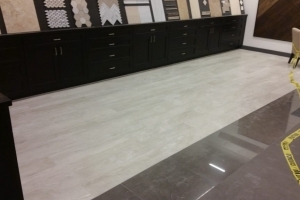 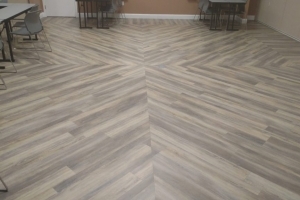 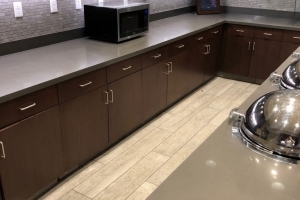 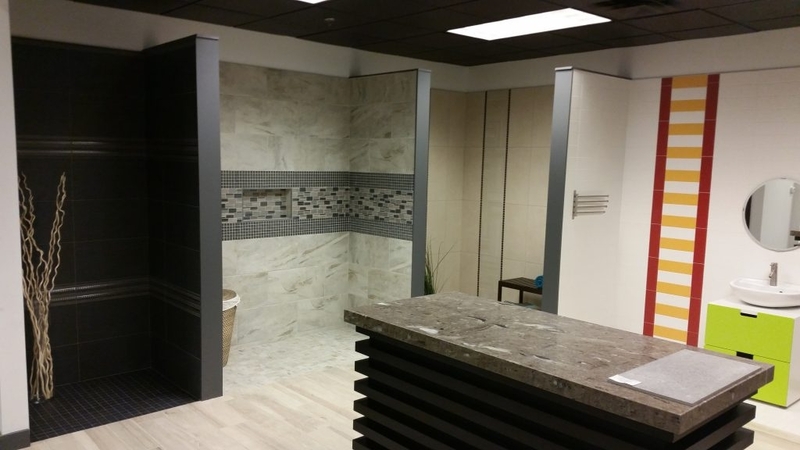 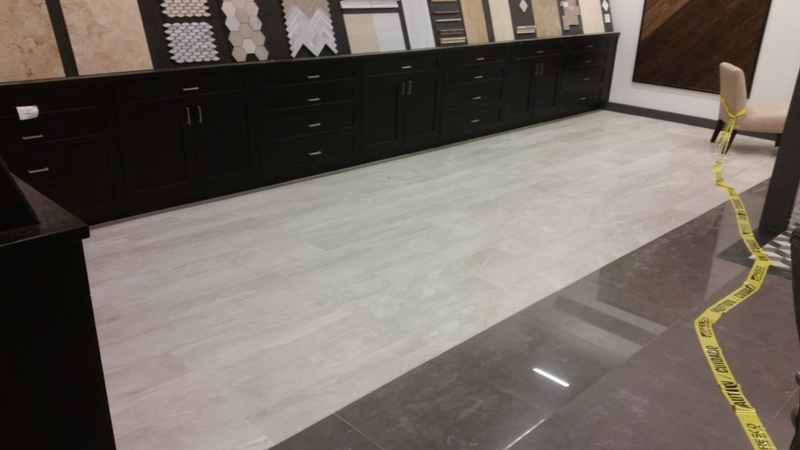 Marazzi Showroom remodel involved 1700 Sq/ft of tile and the reconfiguration of several of its mock up areas and stations. 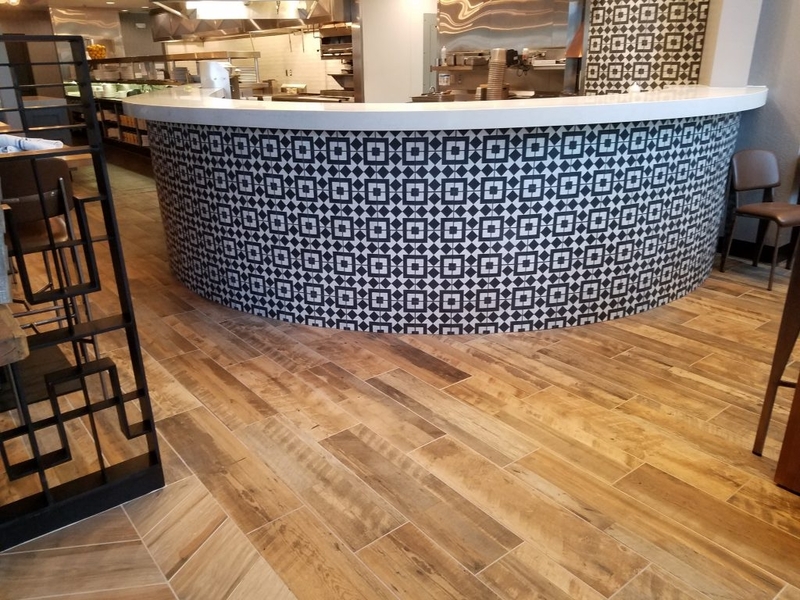 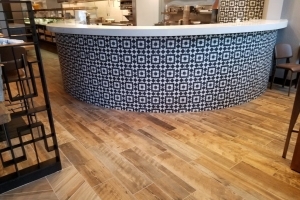 A vast array of tile compositions, types and sizes were utilized in this installation for the counters, walls, and floors. 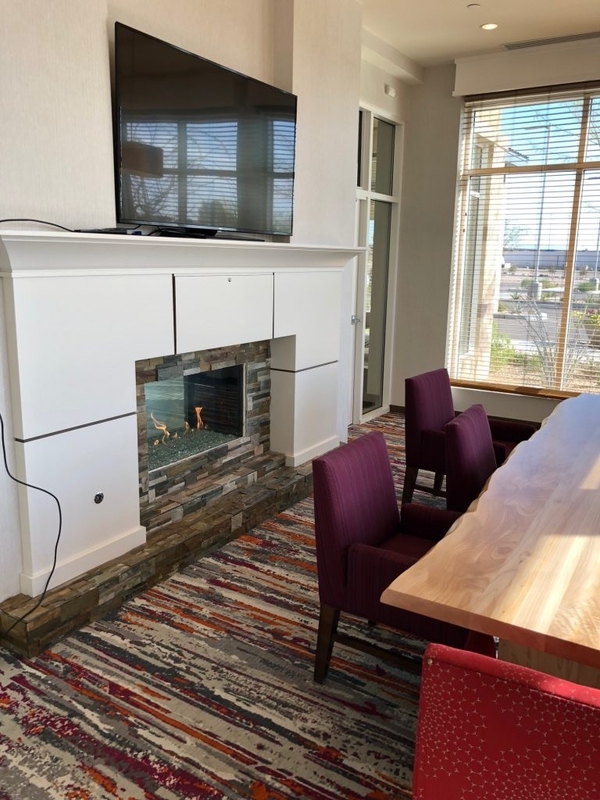 Cambria Hotel Chandler was a ground up, new build. 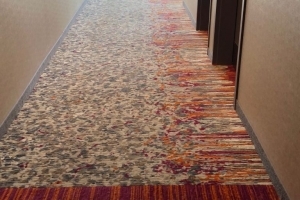 It consisted of 5 floors of guestroom Luxury vinyl planks, with a carpet tile inset in each of the bedrooms. 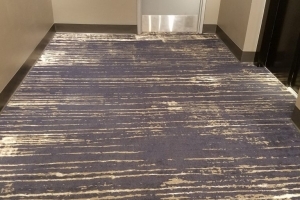 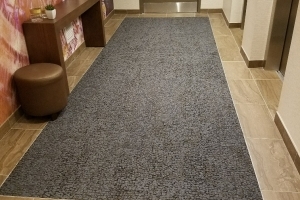 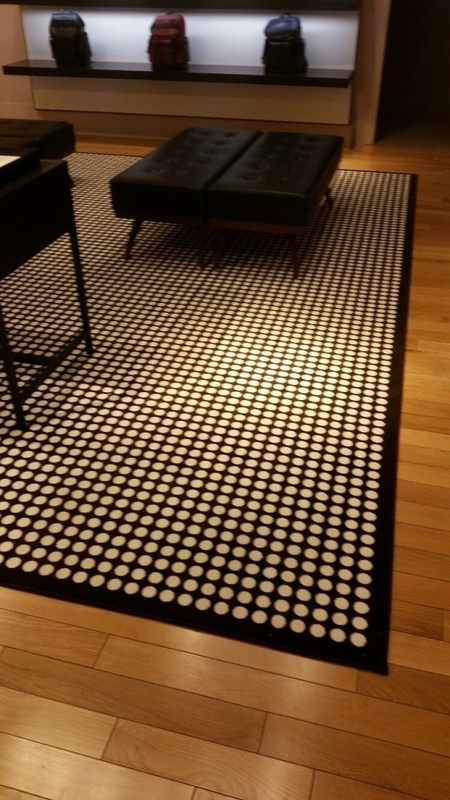 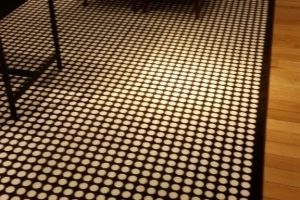 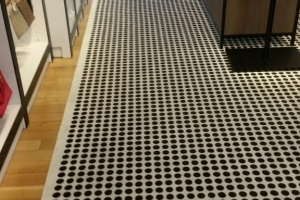 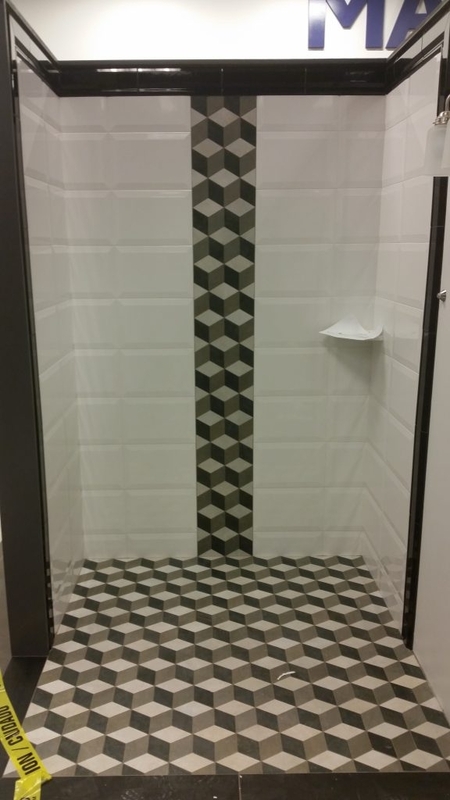 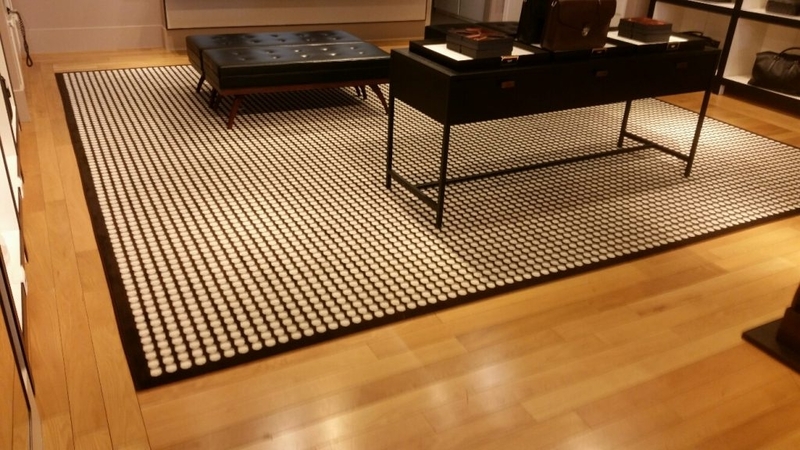 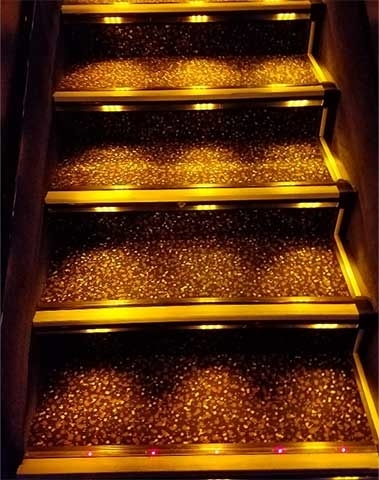 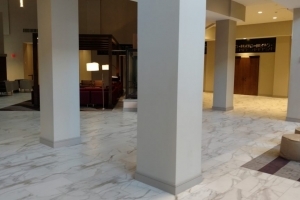 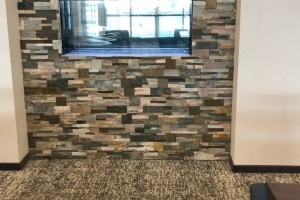 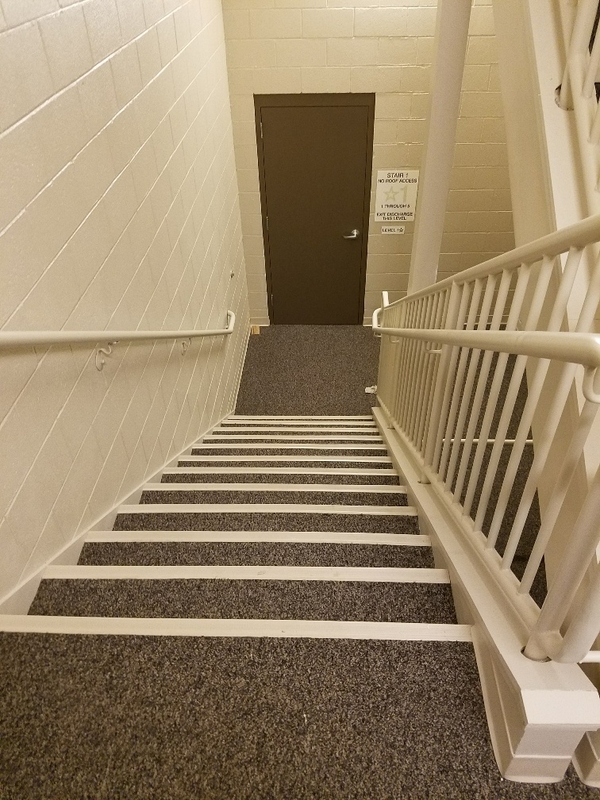 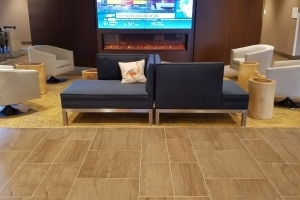 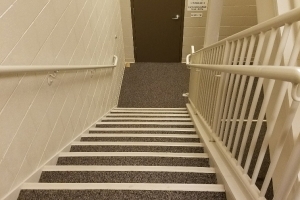 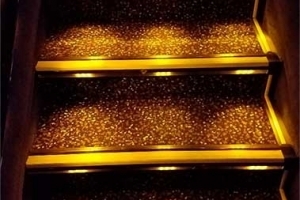 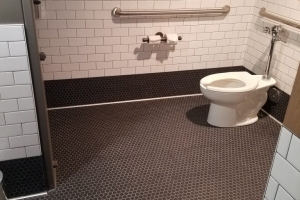 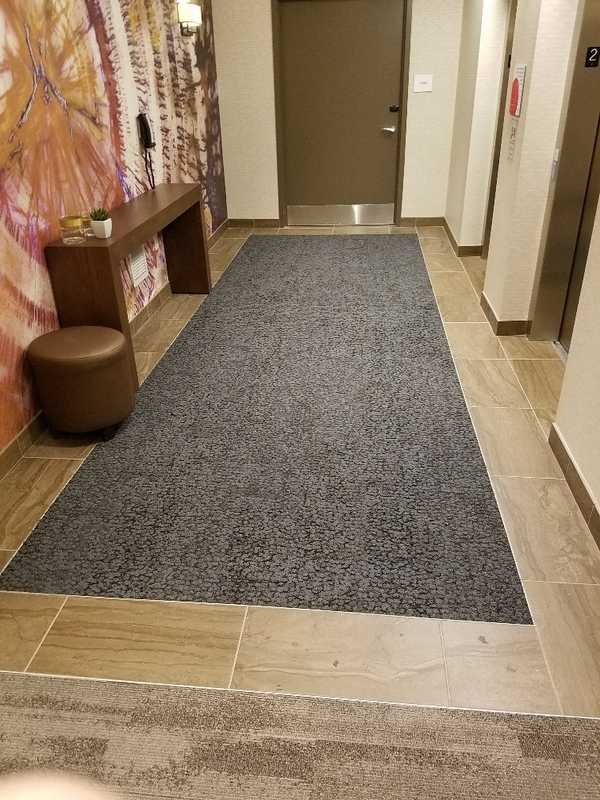 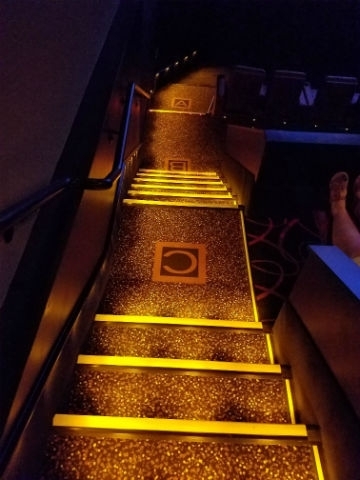 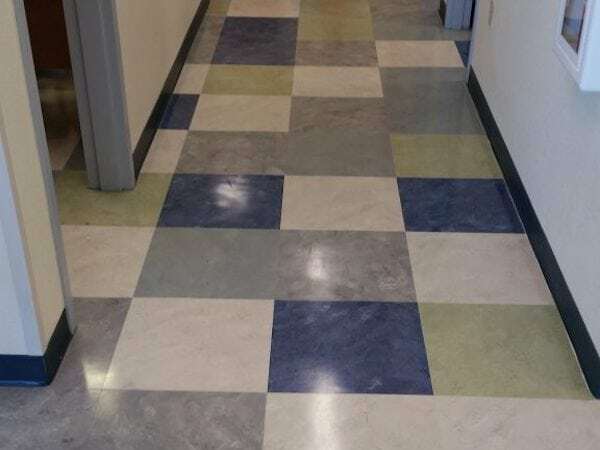 At every elevator landing, there were 12×24″ porcelain tiles wrapping a carpet inset with schluter metal. 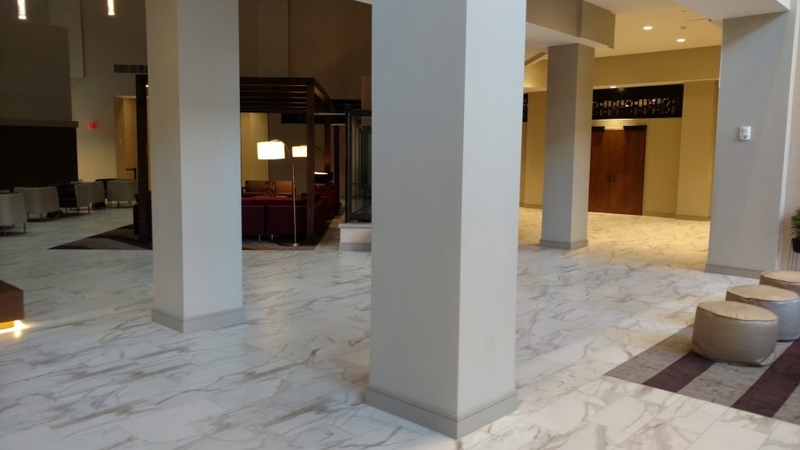 At 1st floor, there were hand crafted tiles on walls, stone on columns, multi sized large format tiles at main lobby and tile in restrooms. 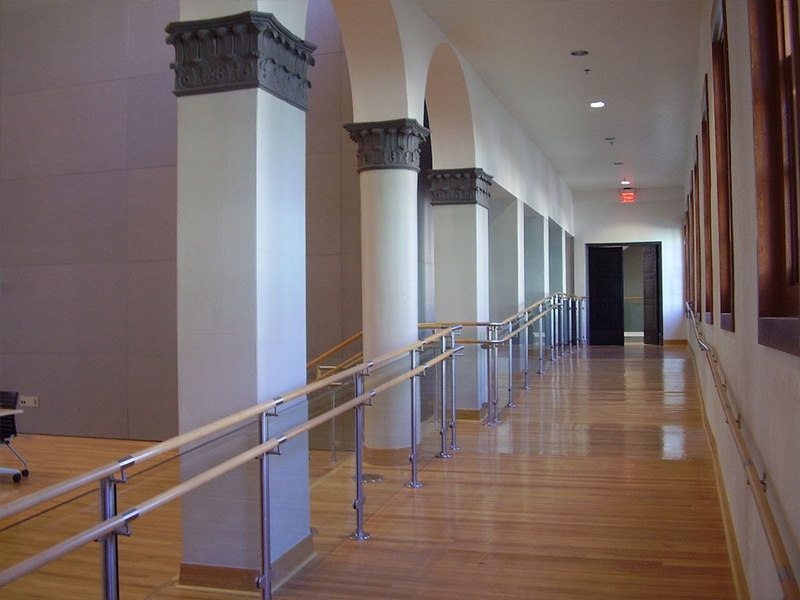 This was part of a Phoenix Historical Society Project. 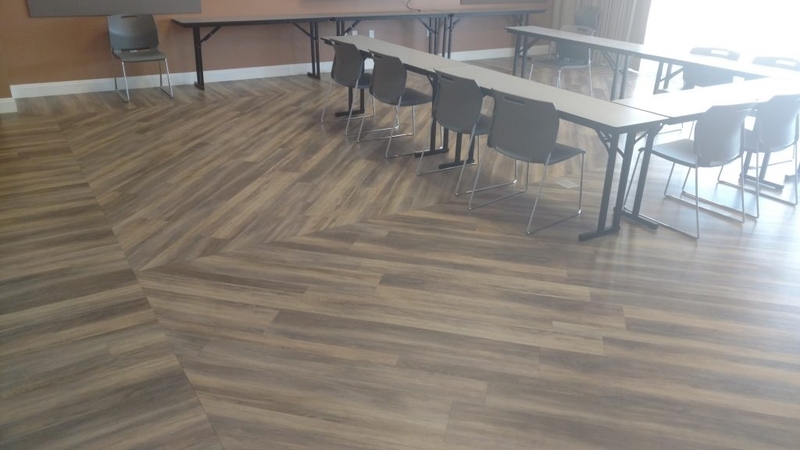 It consisted of installing over 8,000 Sq/ft of re-clamaited historical hardwood in an auditorium and classroom/administration buildings. 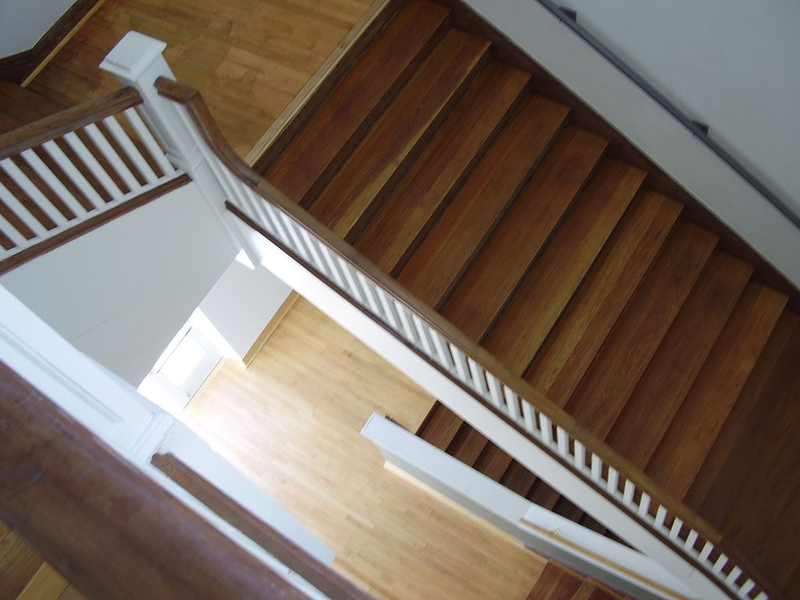 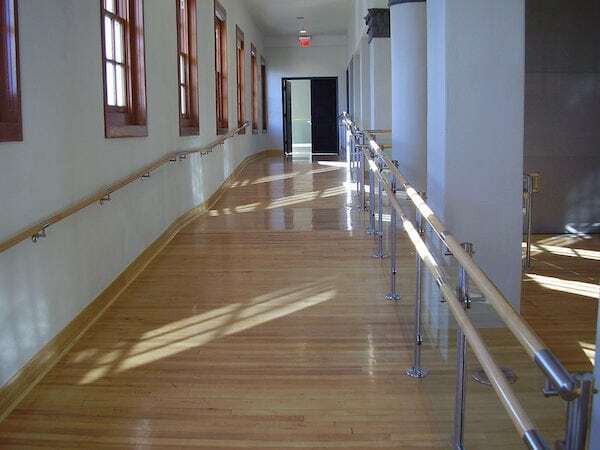 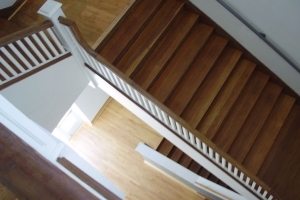 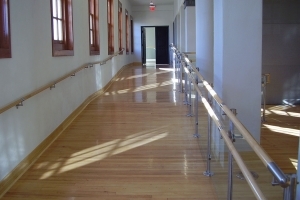 After install, ABS refinished the entire floor until desired consistency and finish was accomplished. 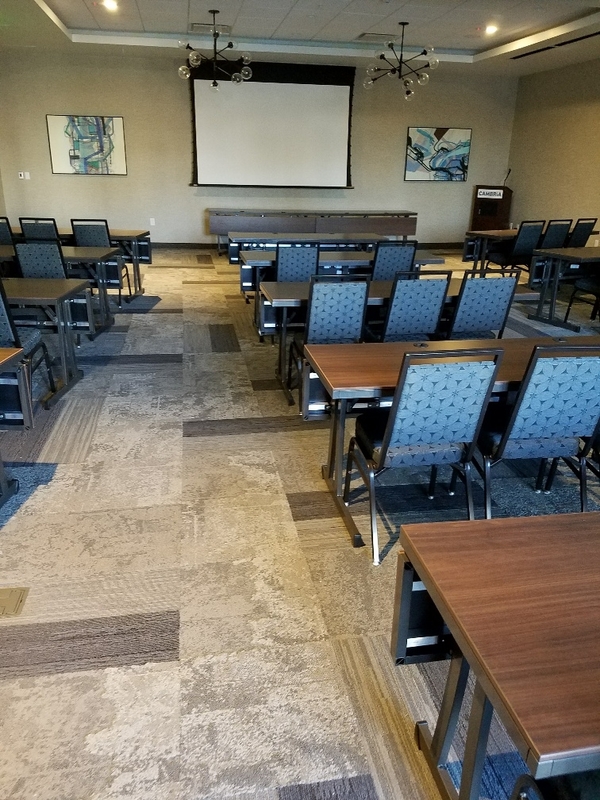 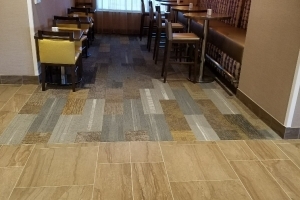 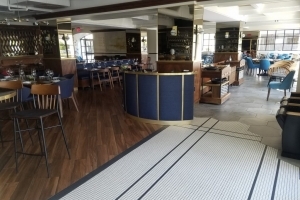 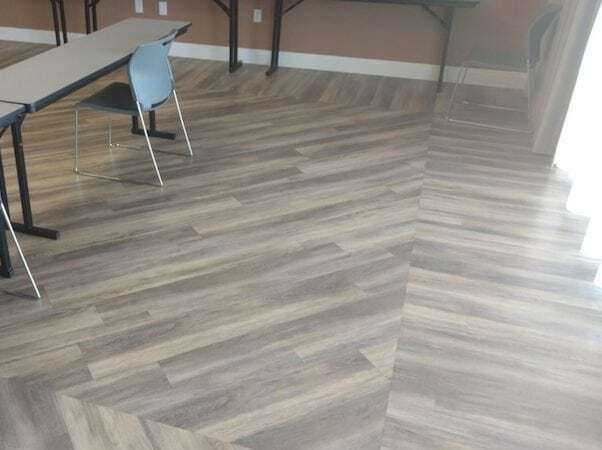 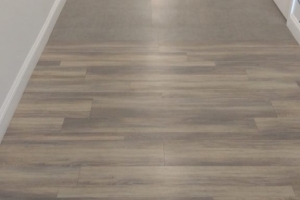 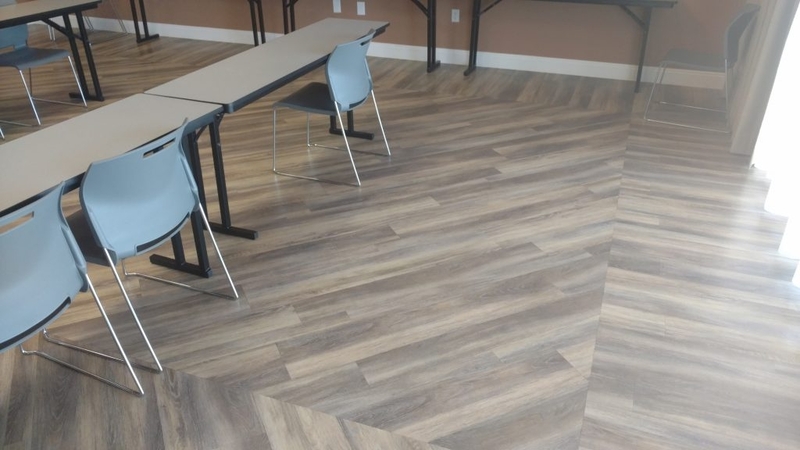 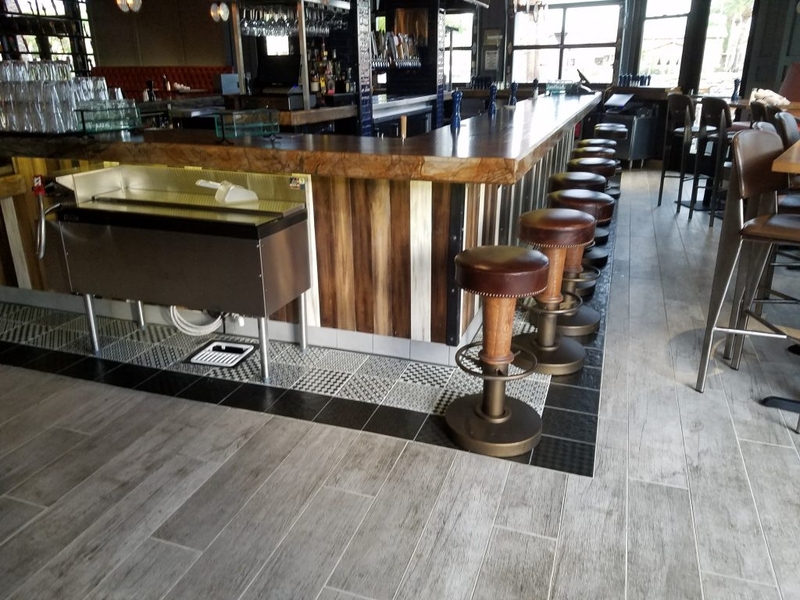 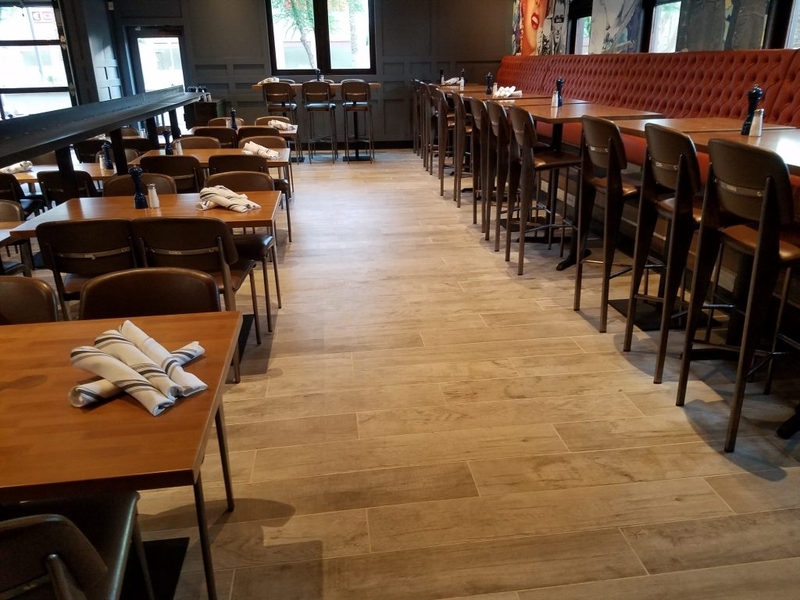 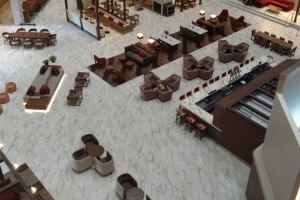 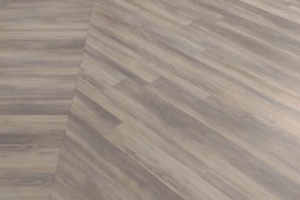 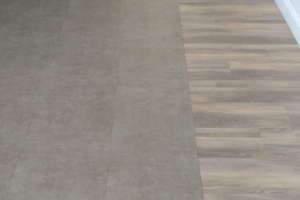 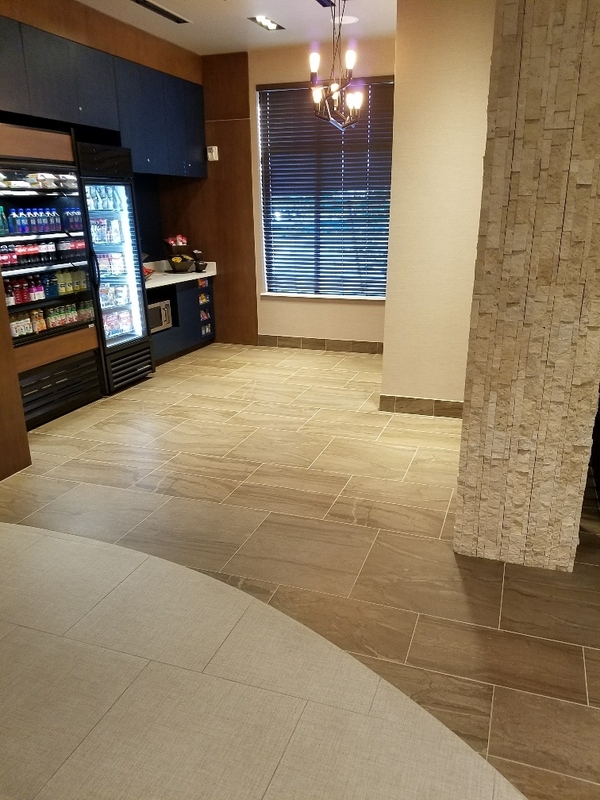 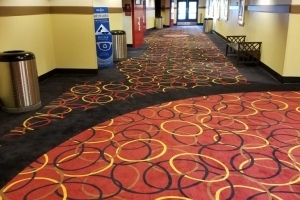 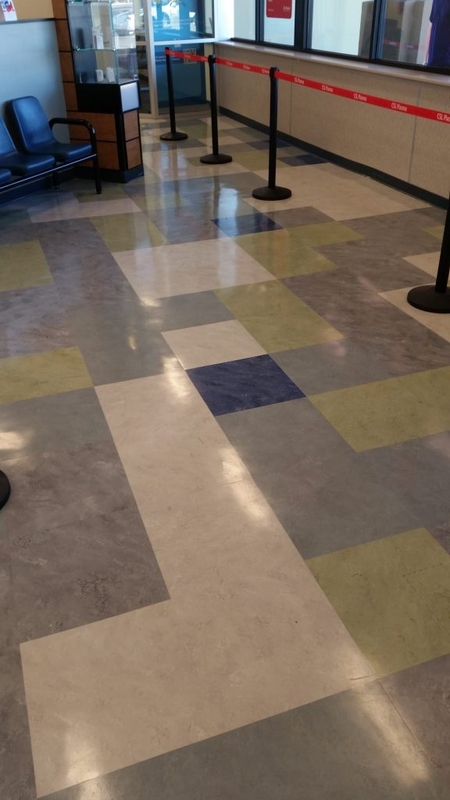 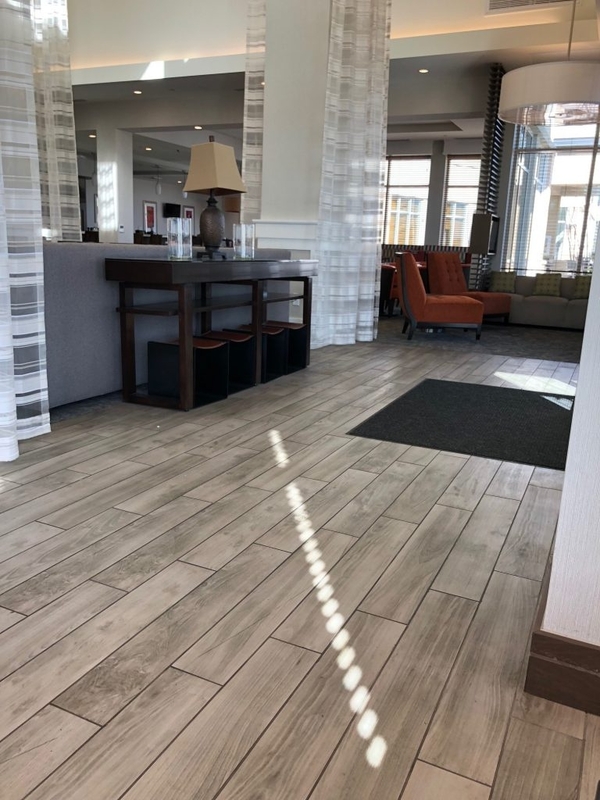 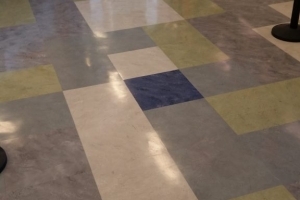 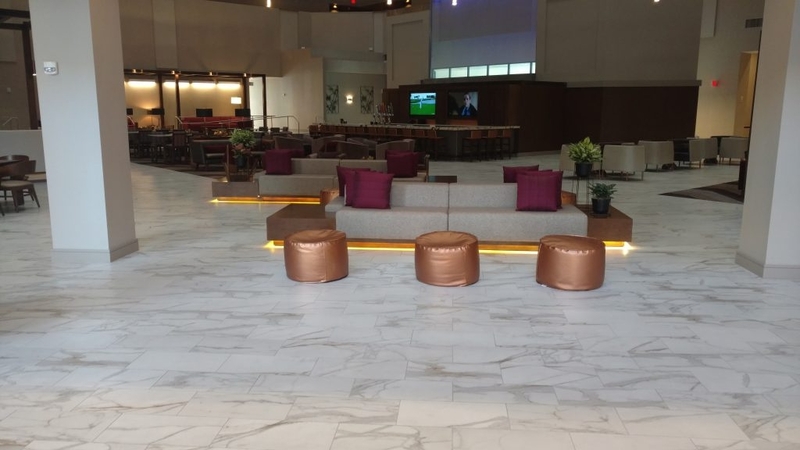 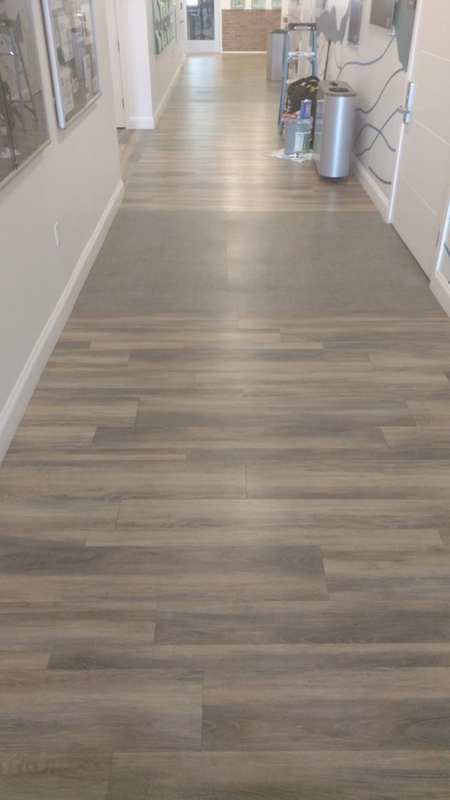 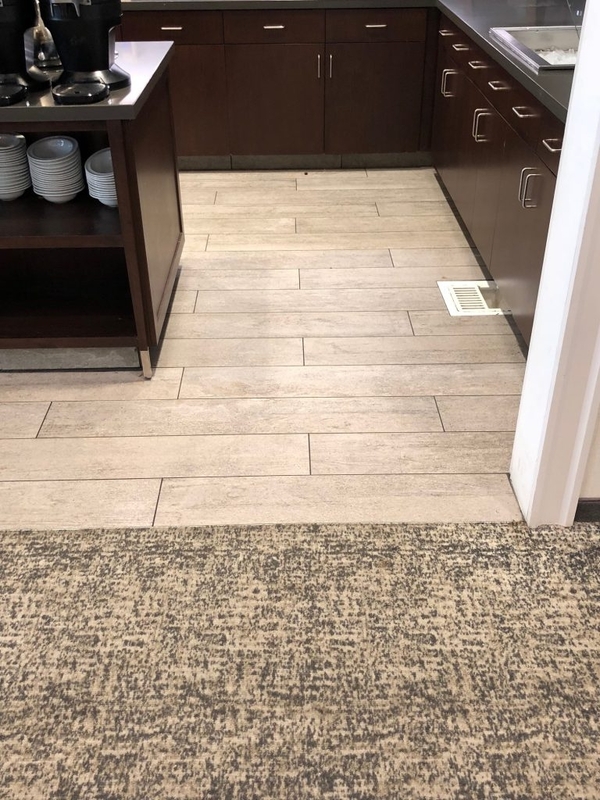 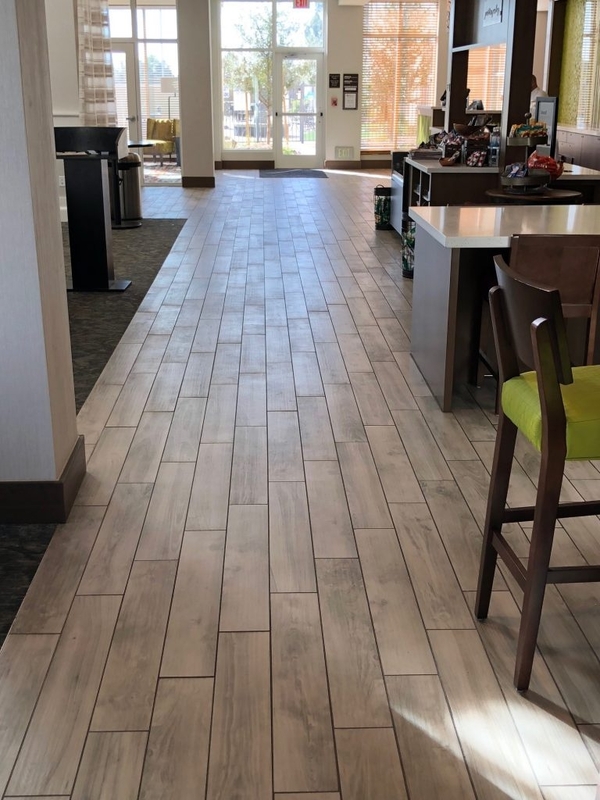 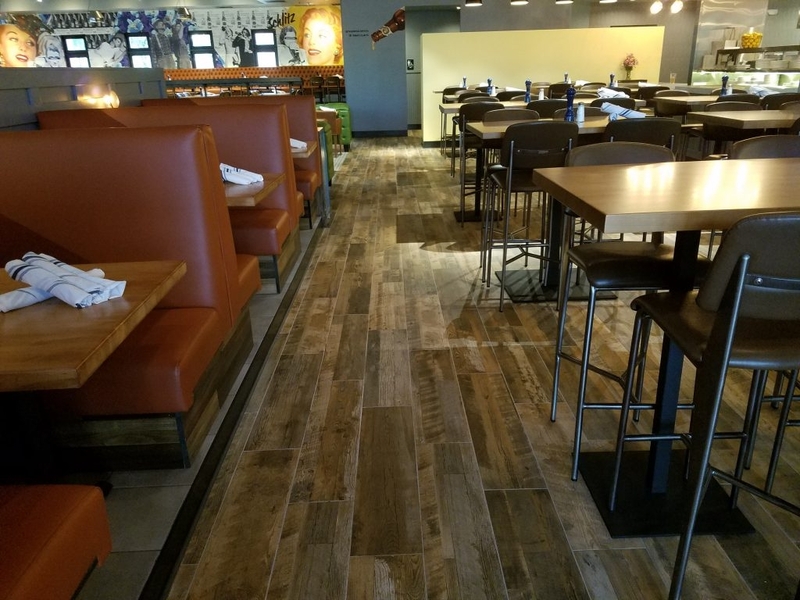 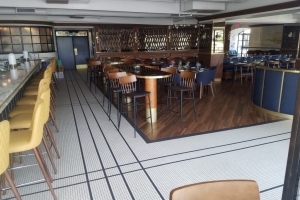 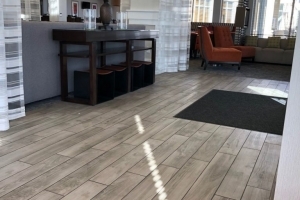 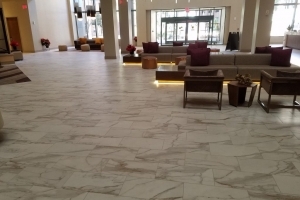 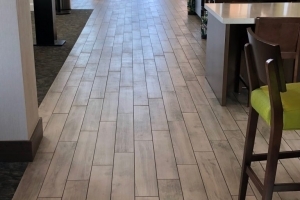 ABS Floor Covering offers commercial flooring installation, floor restoration, polished and stained concrete, and more to Tempe, Scottsdale, Chandler, Mesa, Gilbert, Ahwatukee, Glendale, and the surrounding Phoenix AZ region.